I haven’t been blogging as much for a couple of reasons – first off, no fun play days to tell you all about! Second off, getting home earlier in the evening means I have time to do stuff, which means I have less time to sit in front of the screen typing to you all, if that makes sense. For instance – Monday after work, I raced home in time to get to the PO (we weren’t able to go at all this weekend) and then I ran to the dump which closes at 5 (ditto) and then to the grocery store, where I found that Monday late afternoon is when all the really slow people from out of town like to shop. Thanks to the new store remodel that only allows for shopping in one direction (no room to pass in the aisles) it took FOREVER to get a bag full of stuff. By the time I got home and made dinner, it was time for bed! I was quite bummed to not stay awake until after dark, because apparently we had a fabulous Northern Lights display. Dang. Tuesday night I scrambled around cleaning the pellet stove so I could light it for the evening, it was that damp and raw outside and in. Had a long talk with Dad, and then it was bed time again! Jeesh. Wednesday I went to physical therapy for my sore foot – turns out I have something the PT folks call “pump bump” which is pretty funny (although sore) as I have not worn pumps in at least ten years, likely longer. In my case, I suspect it is actually “Teva bump” Anyway, I had an ultrasound treatment followed by massage and ice, and it already feels better. I am slated for a couple more of these treatments, and then we will see how it feels. Good news – Get to wear my birks all the time. Watch your feet, folks, it seems this is often caused by a shoe that doesn’t cling tight to your hell – so tie your shoes tight and don’t walk miles in the pumps. I got home from that, and A said she was craving pizza, so out we went and by the time we got home – you guessed it – bed time. 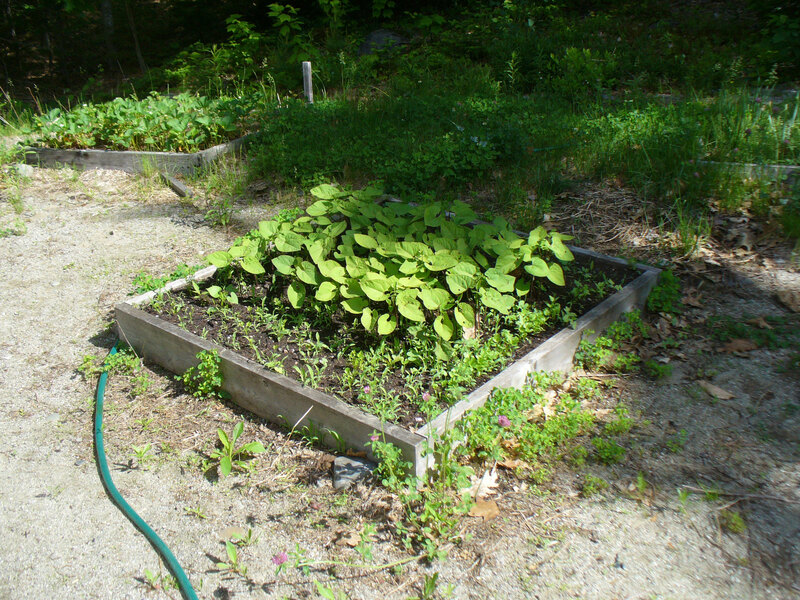 Tonight, I need to do a lot of work in the yard, with all the rain the last week or so, the weeds in the yard (I can’t call it a lawn) are really growing wild. 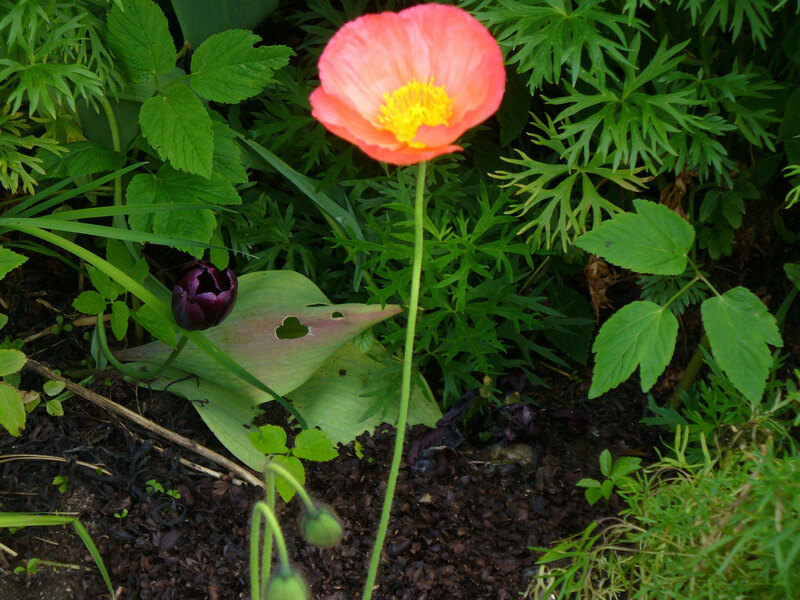 As are the plants, finally – blossoms on the tomato, I noticed this morning! If I get in before bed time, I will try to get the yard photos off the camera for you all – I promised them last week, I know, and did not deliver. Tomorrow is Friday, and since I miss my list, I will give you one. It is pathetic, however. I’ll rise at 4:30 as usual, and go off to work for the day. In the evening (which is supposed to be nice) I hope to sit on the porch and do some knitting. But I bet I will do that, take a look outside and decide I really need to just trim/move/shovel that one thing, and go off and do it until I am tired. 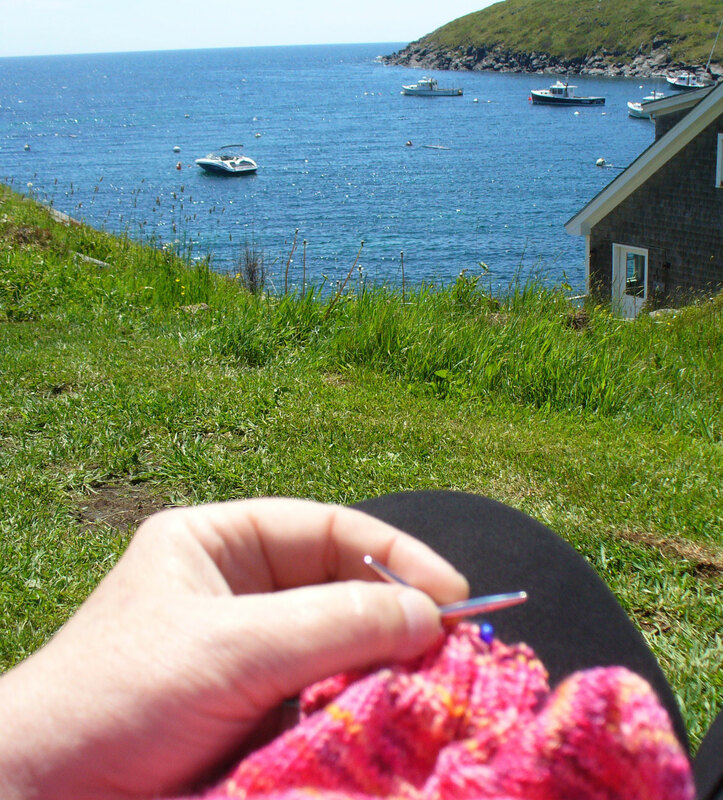 I have done a bit of knitting – especially last week between the trip to Monhegan, and then a day out with A on Saturday, and a rainy crappy Sunday. I have a sock and a half done, plus about half a Leftie Shawl (knit in worsted weight, so it is going nice and fast) and I fiddled with a bracelet design that I think will work, so I will knit that up this week to see if I am right. I also finished a second, really short version of Indian Feathers, using the Noro Silk Garden Lite I mentioned a while back. I had a plan to knit a full-sized Indian Feathers with it and the soft purple I got at Fiber Frolic, but I couldn’t get it all to work the way I wanted, so I just knit one with twelve feathers. I think I can put buttons on it and it will be a very fancy neck warmer/cowl type thing. Still have to block that. 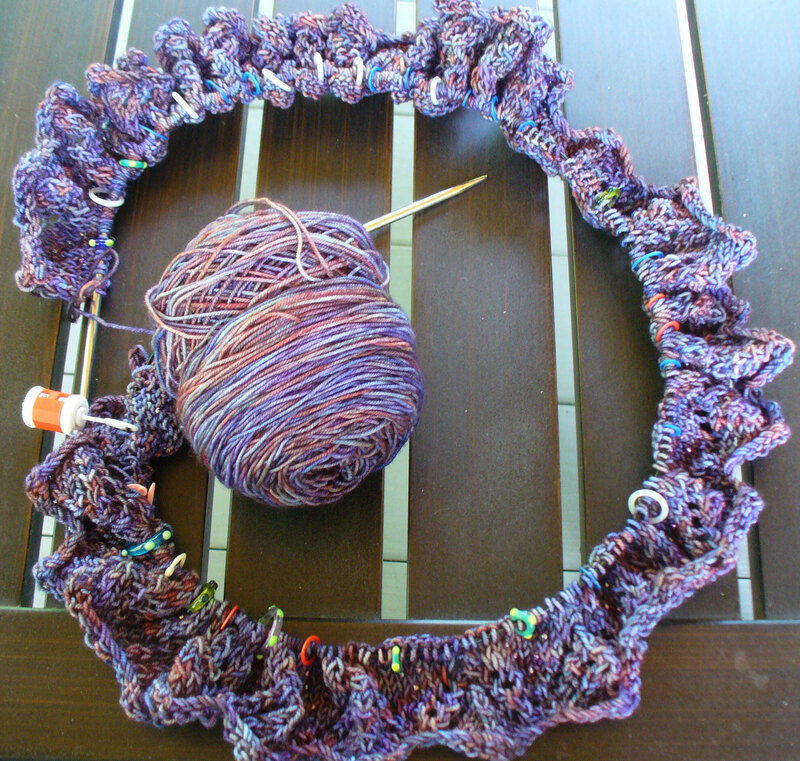 Been searching for the perfect pattern to make something with my other fiber Frolic treasure, the Monet skein. I don’t think it will be Indian Feathers, which I had thought, because I don’t care for how the edge rolls. I also have been looking for the perfect pattern for a treasure I brought home on Saturday, which I haven’t shown you yet, as I have no photos. I’ll hold off on telling you about that until I do… but let’s just say I completely lucked out and ran with a color combination that is very unlike me and got Kid silk noir at a 75% discount. Yep, buy one, get three more. I cleaned them out. 🙂 Of course, they only had 4…. Well, it is time to get out and work. I’ll get the camera cleaned off for you soon and let you see what I have ben working on inside and out. 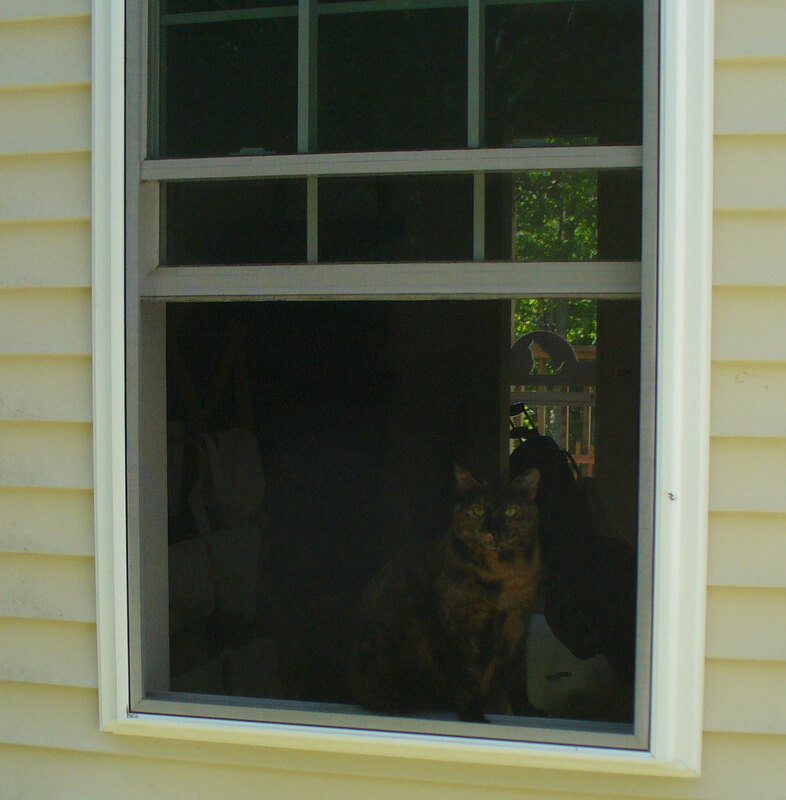 I love this place, but it isn’t for everyone – Mom thinks she doesn’t need to go again next year. Stepdad would have been OK not going this year. A didn’t go this year. They all think there is nothing to do. Of course if you paint, there is plenty of that to do. And there are galleries to explore. 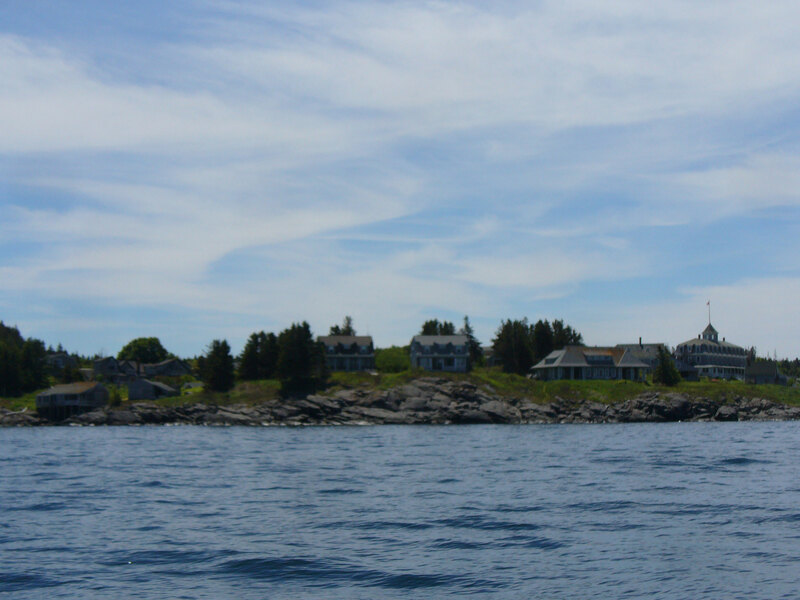 This year, we stayed at the Island Inn, because it would be easy for a non-walking stepdad to get to, and because it has private baths. 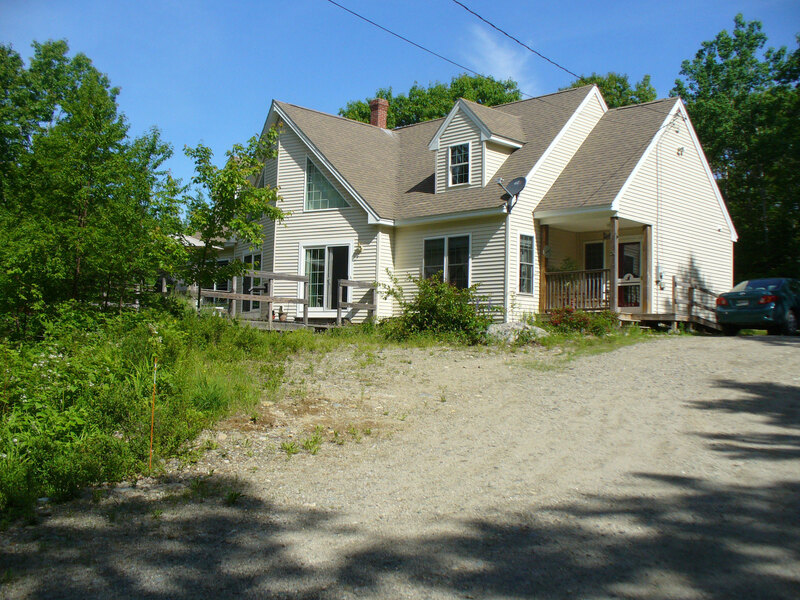 Plus it has that porch…and lawn. 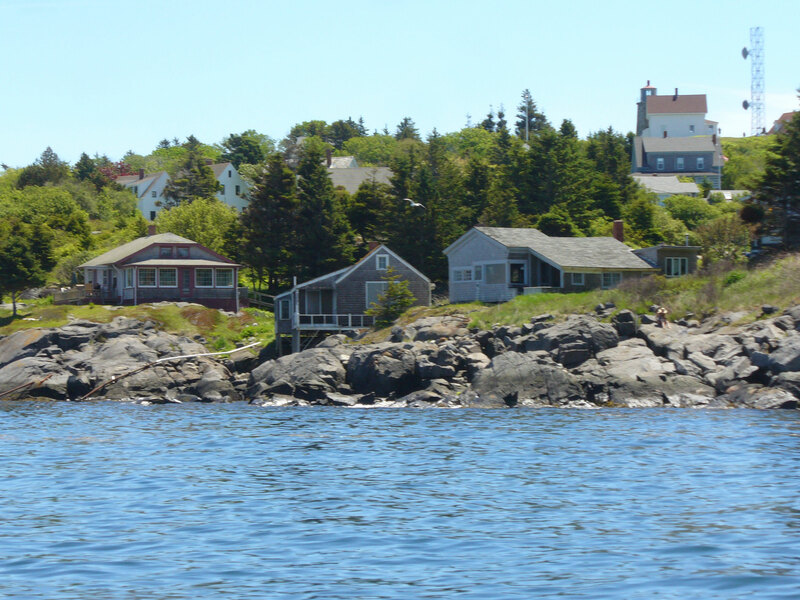 You’ll see – here are my photos – from the dock in Port Clyde, past a famous little lighthouse and an immature eagle, to the island, then through two days there and back across the Gulf of Maine to home, with a brief slow down for seals on a rock. I loved every minute of it. 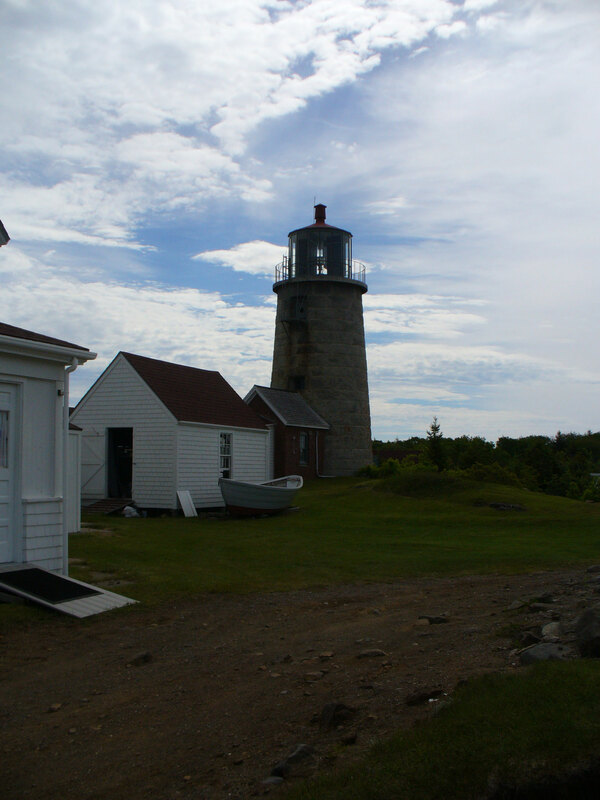 Marshall Point Light – famous for being the lighthouse Forrest Gump runs out to touch in his transcontinental run. 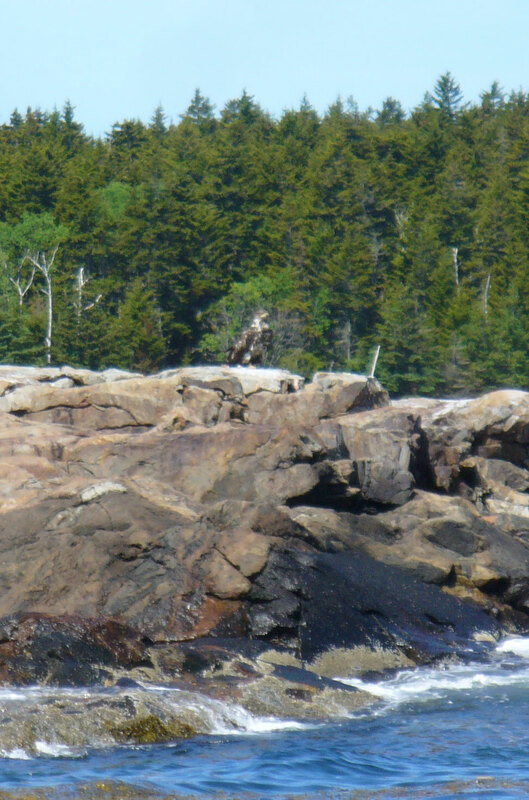 A young eagle just sitting on a rock, hanging out. Not close enough for a great photo, unfortunately. 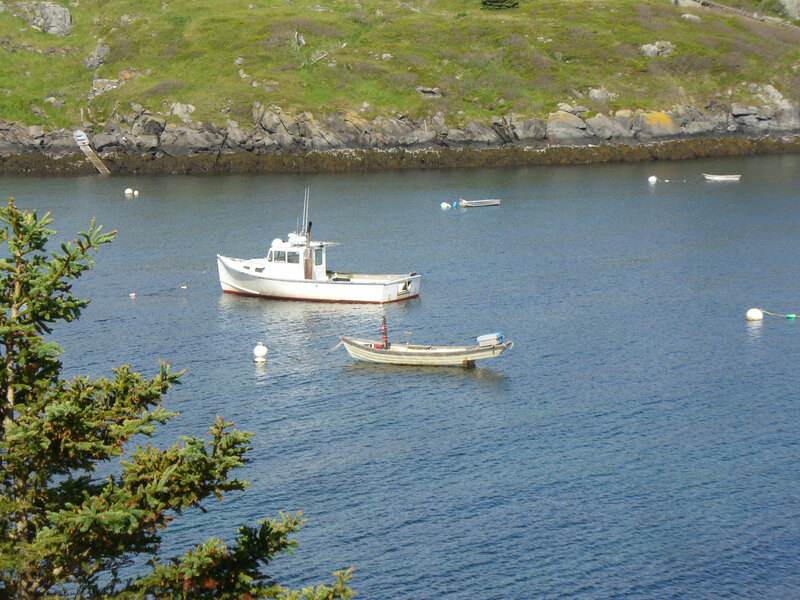 Incoming boat is an important event each day, and most of the island trucks are on hand to meet it, to haul gear and supplies to local hotels and cottages. But not people – unless you are completely infirm, you walk to your destination. No bikes, no mopeds, ne rental cars, in fact, I don’t think there are any cars at all – just pick ups, four wheelers and golf carts. And pickups have the right of way, because they belong to people who are working hard for a living. 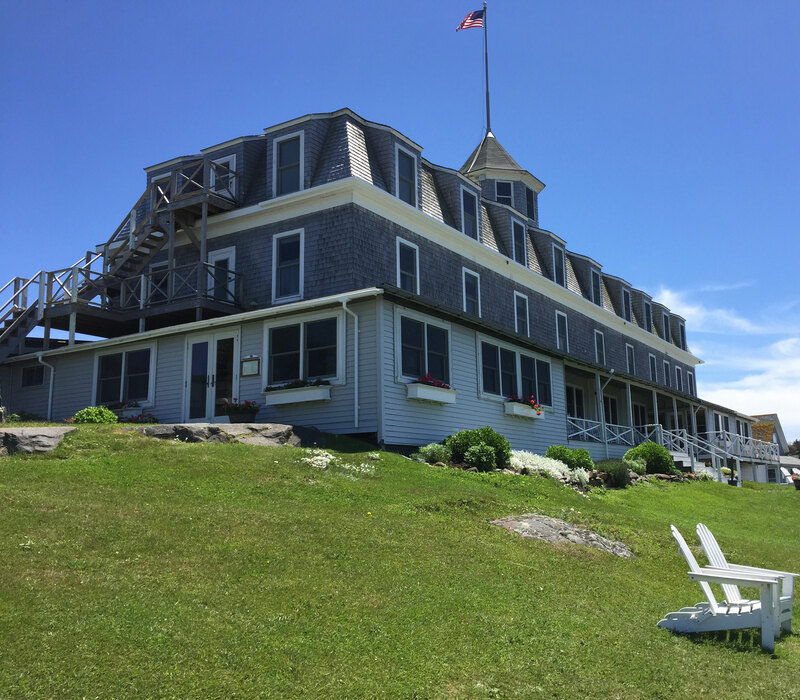 Here’s our hotel – the Island Inn. Our rooms are on the backside – nice and cool as they face east. We had our dinner and breakfast here, but had lunches out while wandering the island. The view from my third floor window, across the “meadow”. If you can spot the flag on the left horizon, you can find the place we usually stay – it is the first building under the flag. Up and over a very high hill, that we knew we didn’t want to walk up and over this trip. And we didn’t. Zipping up it in a golf cart is an entirely different proposition, however! 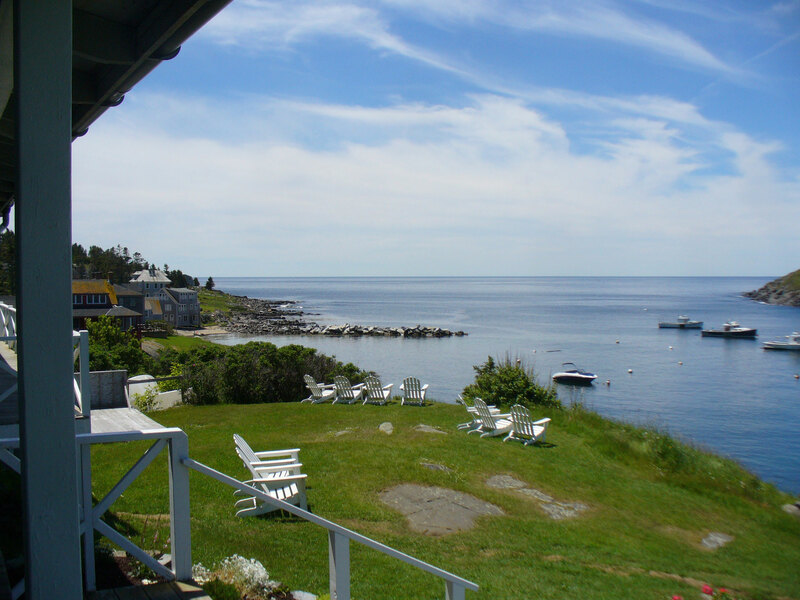 These shots are the view from the hotel porch, where we spent long restful hours, rocking and knitting. 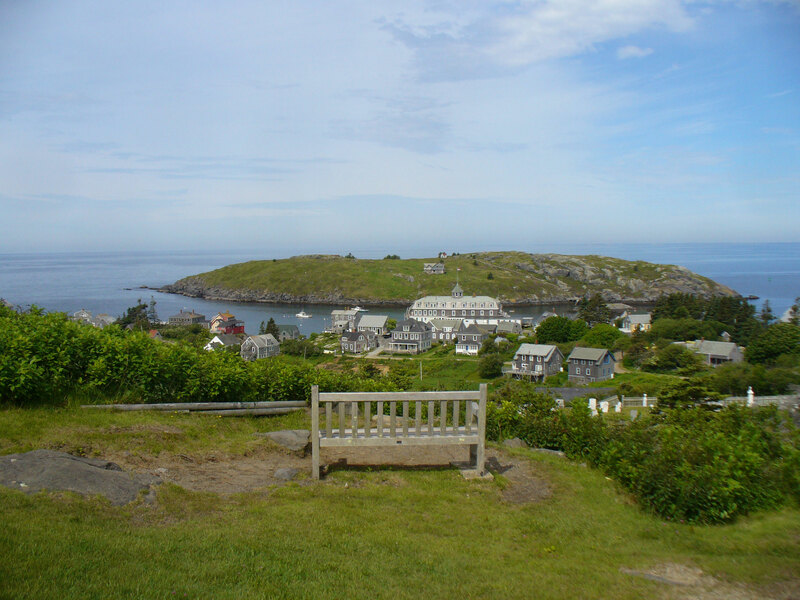 The island across the harbor is Manana. 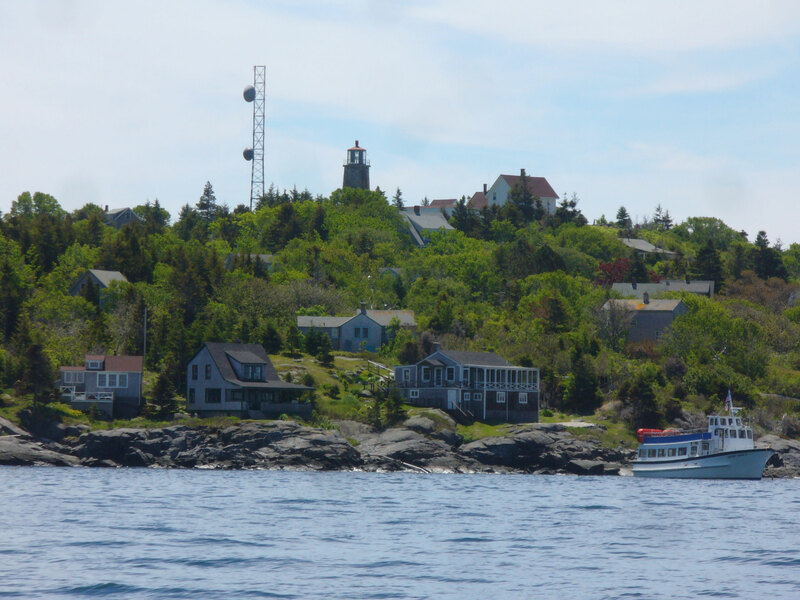 It’s looming and stark, but it’s rocky bulk creates a safe harbor for Monhegan boaters and fishermen. The lighthouse, and the next few shots are the view from the hill it sits on. 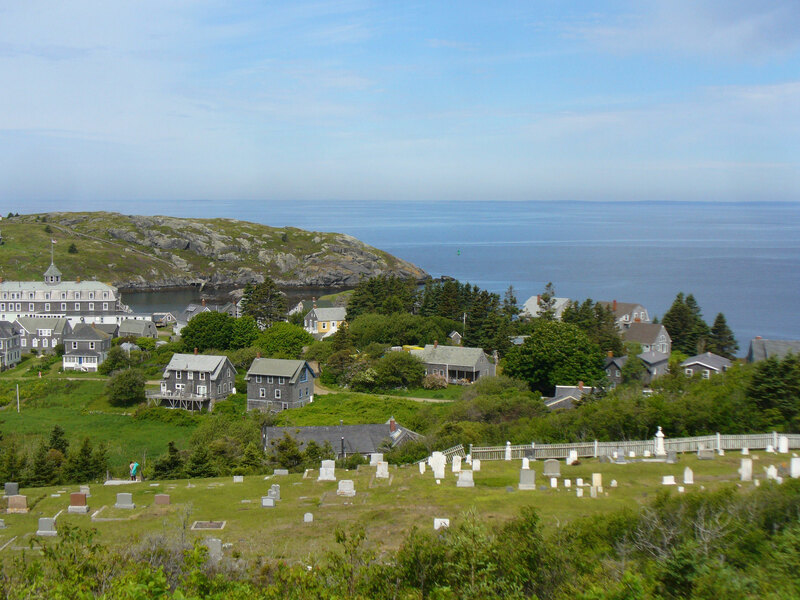 In this shot, you can see the Inn where we stayed – it is the big mansard roofed building in the center of the picture. Our rooms were on this side, which faces east. We got to see the sunrise over the hill. 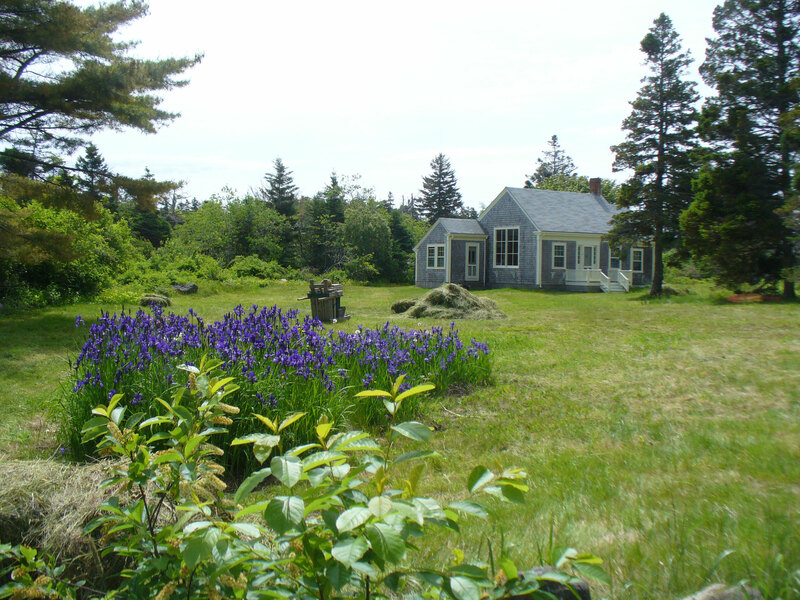 I do love poppies – and gray houses, and of course, blue, of any kind. Any wonder I love this little garden? 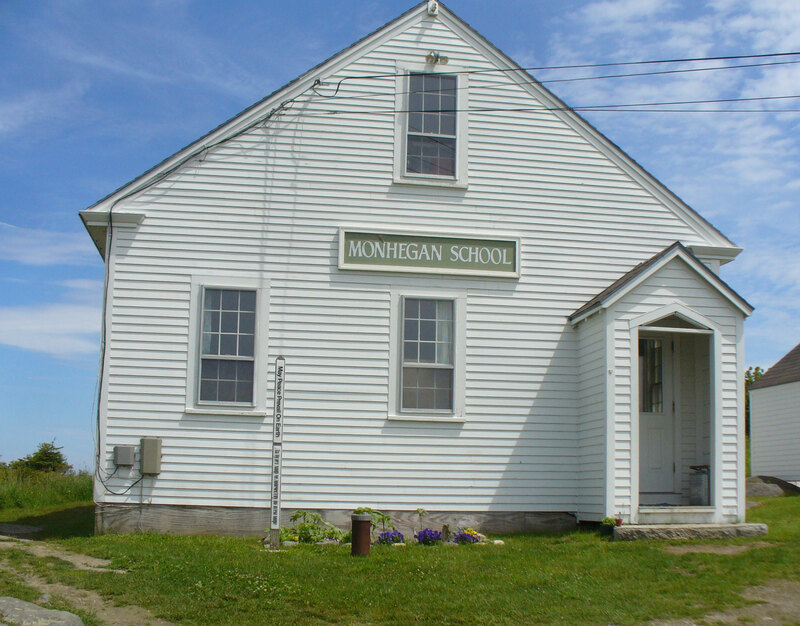 Monhegan’s School – a dwindling year round population means that keeping it open is a big commitment. But without it, you lose the families. So the community makes that commitment, and by all accounts, it is a great school – K-8. 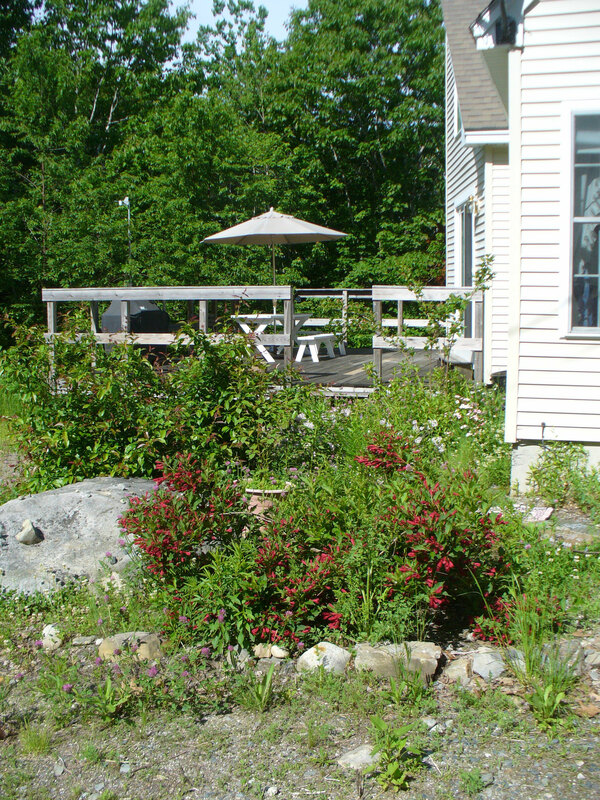 It sits on a rock (of course) but there is a little flower garden under the window. 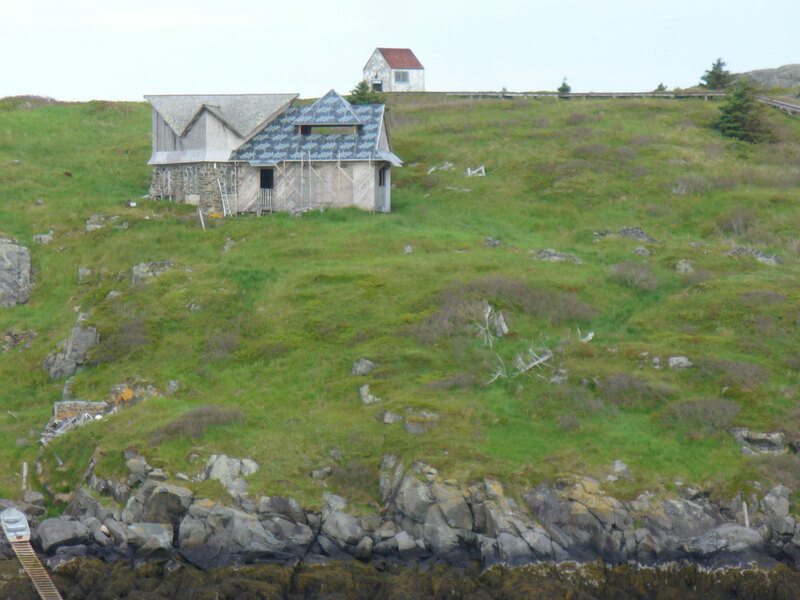 I love that there are little gardens all over this island, tucked wherever there is some soil on the rock. Back to the hotel lawn to await our ferry – of course, some knitting while we wait – I even have Mom knitting out in public these days – and knitting with lace weight yarn – her first time. 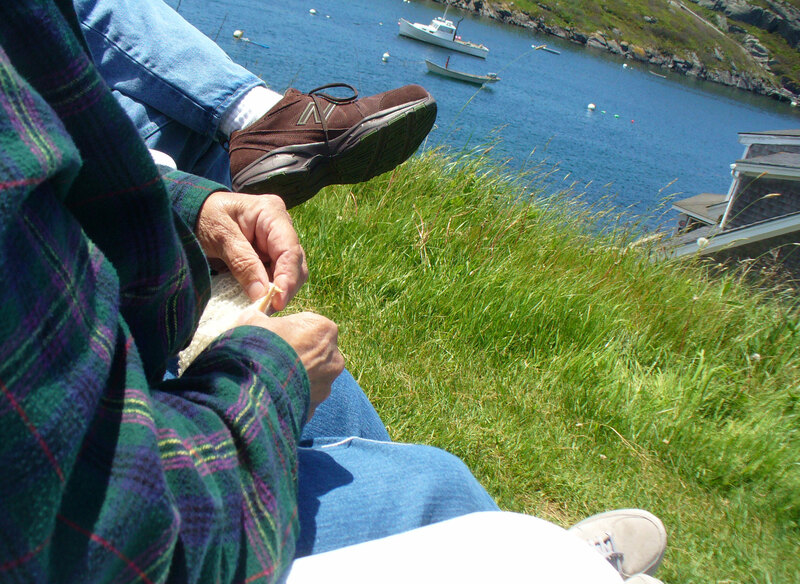 I, of course, had socks on the needles – I cast them on for the trip, because I knew they would be the perfect island project – not too heavy or complicated. I knit most of a sock, so I am glad I had them. 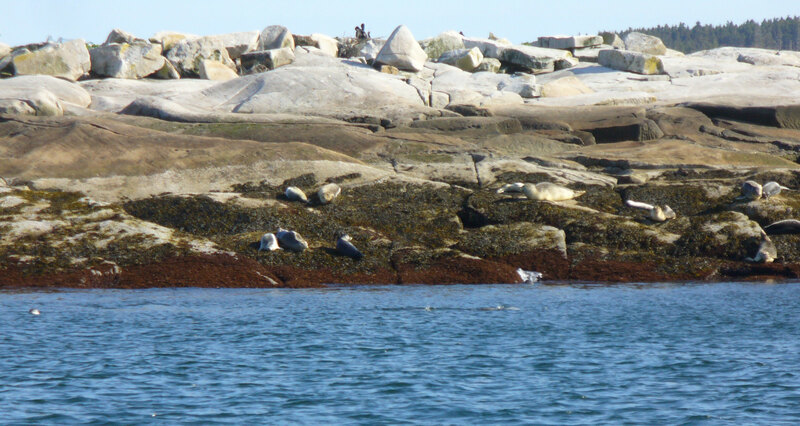 Seals on the rocks on the way home. 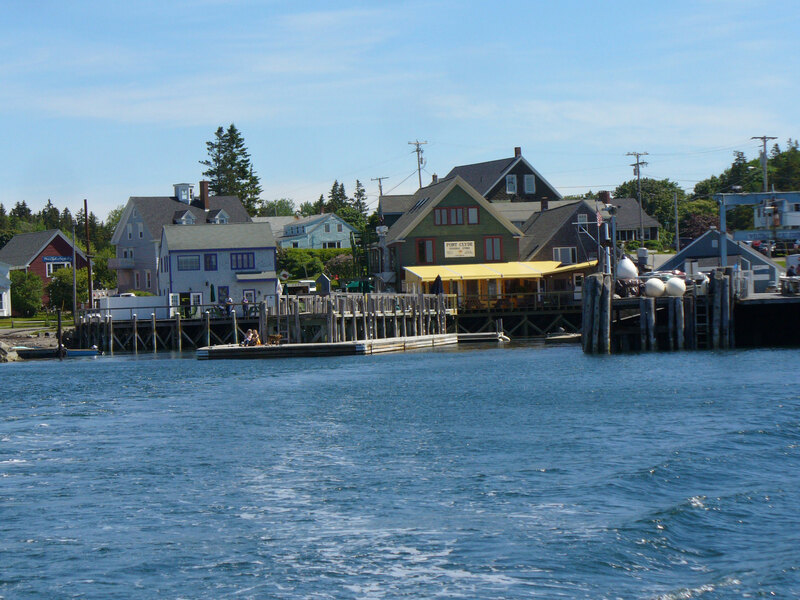 An hour on a ferry is a good transition from Island life to real life. 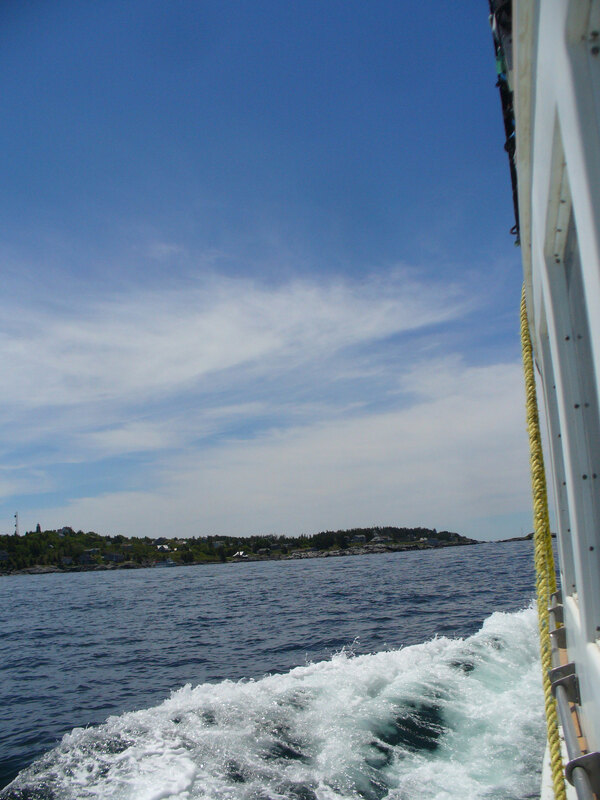 IT is a culture shock to get off the boat, into the car and drive home. I do dream that someday I will be able to live there for a long time, but I know it is just that. And I keep dreaming it anyway. Yep, we are calendarly challenged! Father’s Day is next week. at least we are ahead of the game, not late, right? Author salpal1Posted on June 14, 2015 Categories Uncategorized6 Comments on Yep, we are calendarly challenged! To anyone reading for whom it is an appropriate greeting, happy Father’s Day to you! I hope you get the right number of neckties and funny golf balls and whatever else your great kids thin would be the perfect present. A’s father is long gone and mine is far away, but I will call him later this morning. He is no longer an early riser, so I don’t want to ruin the day by waking him up! Well, I have to say, not much. 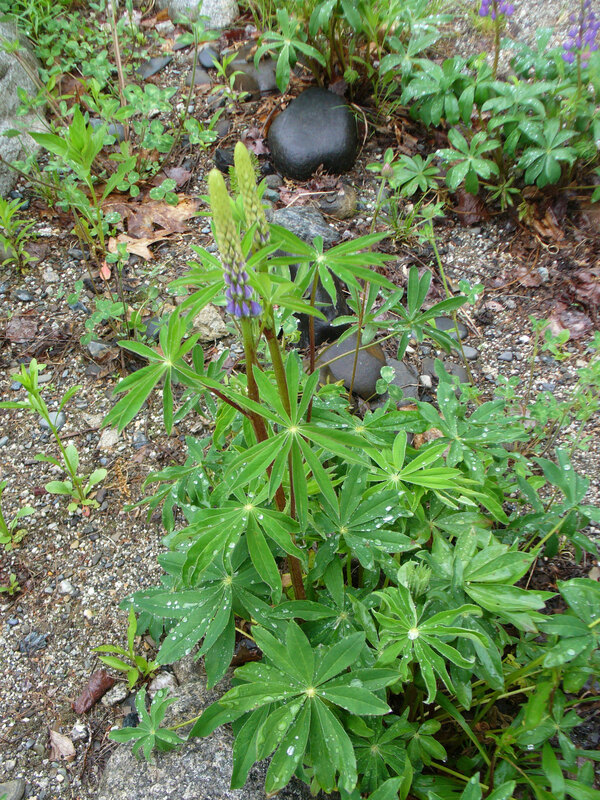 And not much that I took photos of, though I hope to remedy that today. I worked all week, and that is pretty boring to talk about – no big milestones to tell you about. I have been knitting – I finished knitting my Indian feathers, and will block it today, so I should have a photo of that next week. 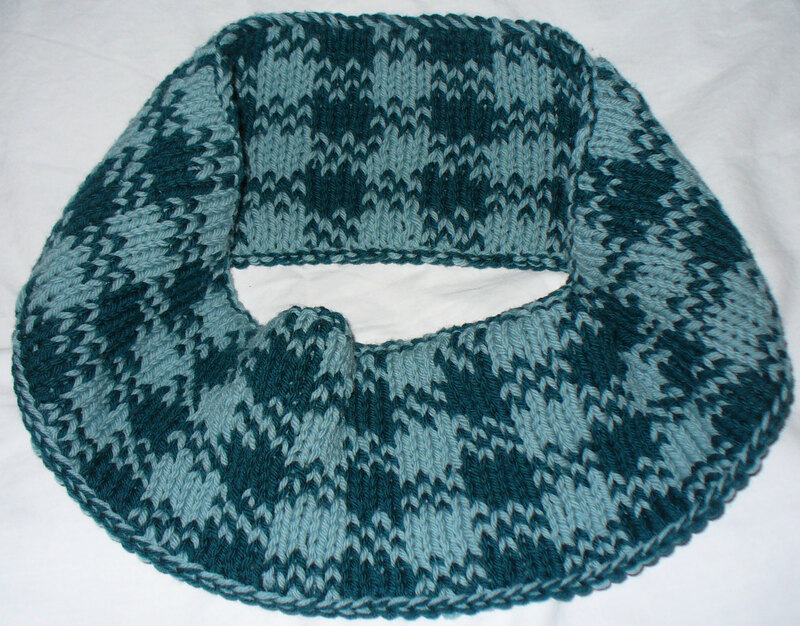 I also finished the Trapper Cowl. It is narrower than I would like, but I was out of yarn. So, if you are thinking of knitting one in Quince and Co Lark, get 2 skeins of each color. Still, I think the narrower one will work well – it is long enough to double over making a super cozy neck warmer, and not so wide it can’t just be worn around the neck like an endless scarf. Albeit a short one. I wound lots of yarn, thought I was all set to start leftie in the yarn I dyed, and then realized I was so focused on the colors that I forgot to wash any of the undyed yarn for the main color! That has been remedied, and it should be dry enough today to ind into a cake and get started. However… that took too long (a day, you know) so I cast on another Indian feather. I am using some silk Garden Noro that I won in a blog giveaway a long time ago from Claire over at Mollie and Claire, and the pale purple yarn I picked up at Fiber Frolic last week. 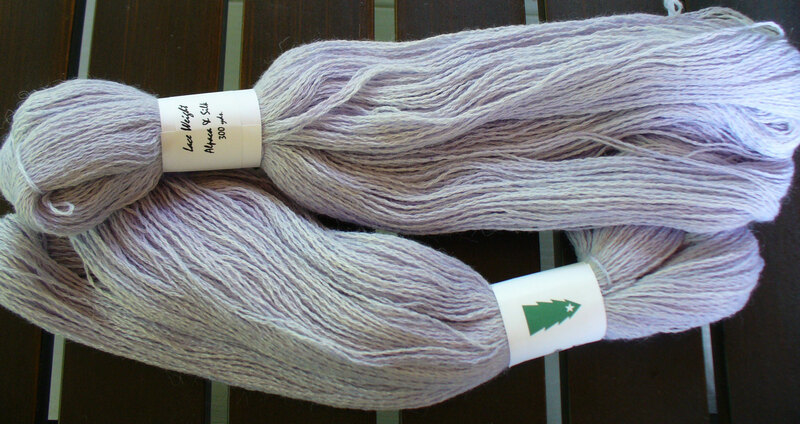 I wound that onto cakes, then wound the two skeins together to make it easier to hold double. I hope it is a close match in weight to the Noro, but I am going for it either way. 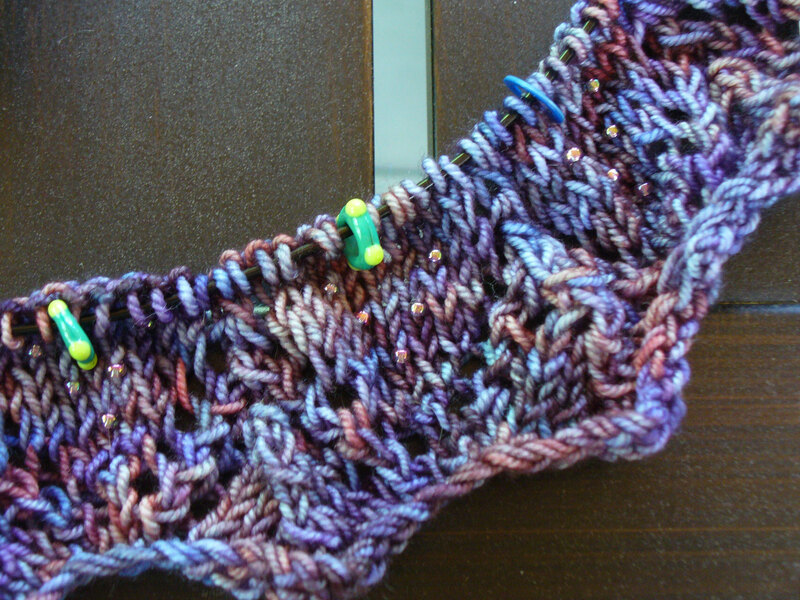 The Noro will be the lace border (with some gold beads, size 6 this time, I can already see the difference) and the purple the stockinette body. I think it will be pretty. 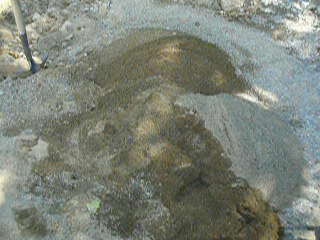 I’ll show you how that is coming along when I get photos later. Well, let’s see. Tuesday night was town meeting. 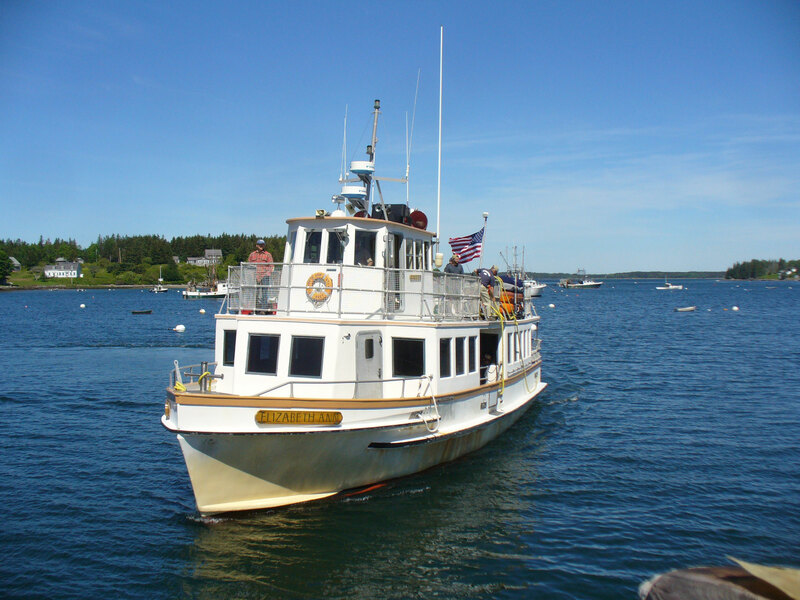 If you aren’t from Maine, you probably don’t know how important town meeting is. It’s where every registered voter in town has the opportunity to come together and decide what we will spend our money on for the next year. The day before we hold secret ballot elections to elect our selectmen and a few other officers of the town, and we vote whether or not to approve the school budget. So the biggest chunk of money, by far, is already decided upon before the meeting. At meeting we get to discuss everything else. What gets the most conversation is why do we support the libraries in the two towns adjacent to us? 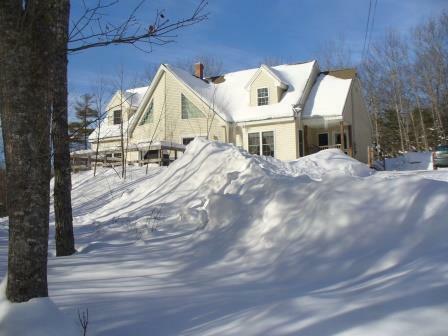 Are we putting enough in the snow plowing budget? Enough in the General Assistance budget? Then we vote and it is unanimous to keep on doing it all as proposed. Our town hasn’t had too much going on that is controversial, but by next year we will. We will have to decide what to do with the town dam – replace it, remove it? Do some other alternative? It already raised some conversation when all we were doing was raising money for the study. So although we were done in an hour this year, I think next year will be a longer and more heated meeting. A went with me this year, which is unusual. They handed her a little popsicle stick with some bright cardstock glued to it and she said “What’s this for?” “To vote” was the answer she looked at me, I said come on, you will see. When they called for a vote, all for? All Against? You wave your little flag at the appropriate time. Very public and open and fun, I think. I suspect she found it hokey and boring, but she voted and paid attention. We pay a lot in taxes, I like to make sure some of it goes to things I believe in – like General Assistance and the Library. Friday night we went up to Orono, where A’s niece and her family live. Niece E the elder is graduating from High school today, but they had no party planned. We created our own by going to their Friday night coffee-house with her cards and presents. She and her dad perform there, she has a lovely voce, and so we got to hear them sing, and give her the presents, too. I knew her dad was a musician in hos soul, but had never heard him before – he really is quite good. He sang with her, then accompanied another, and closed us out with, of course, This Land is Your Land. It was a fun evening, and we were home at a very decent hour. 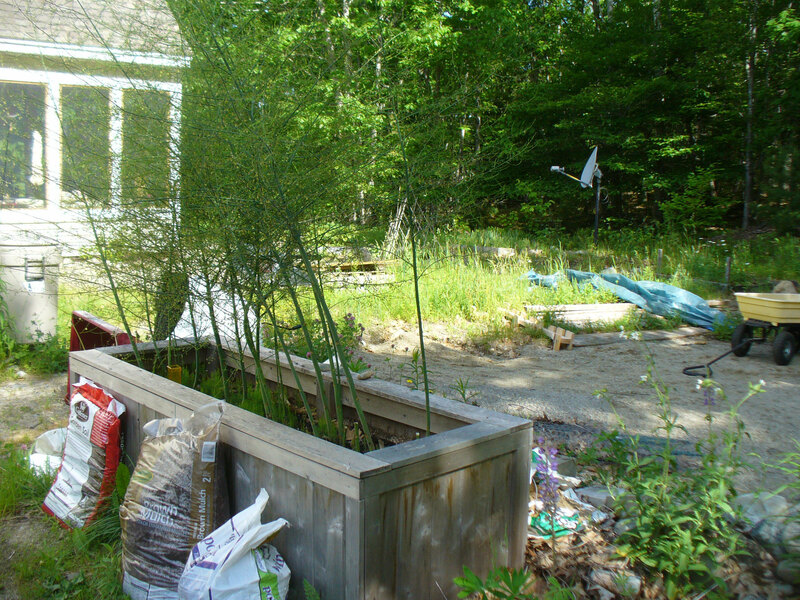 Today I will do a little more yard work, I didn’t do as much as I would have liked yesterday, and then get cleaned up and go off to visit my dear friend and her family who are here on vacation. 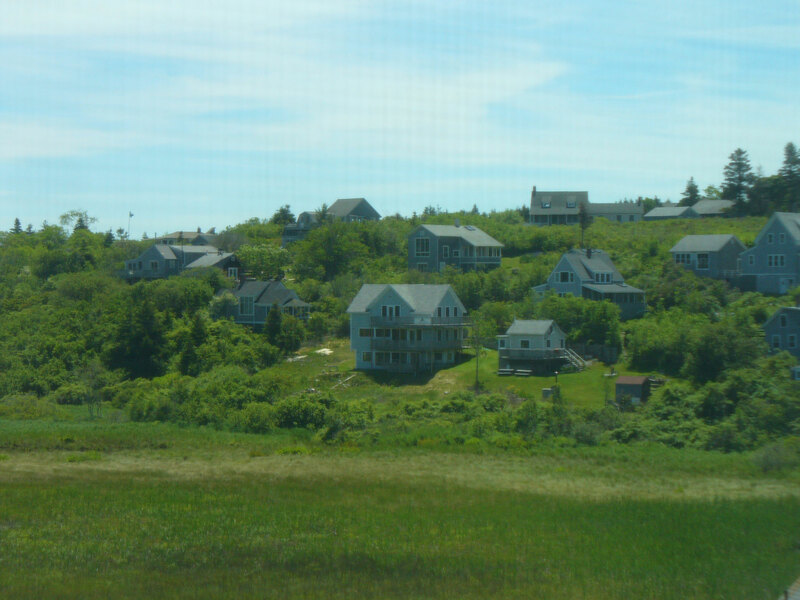 They live in Iowa, so them being in Maine is a BIG DEAL. Long trip with two kids. I do wish they had not moved away, but I understand and am just glad they come back on vacation as often as they do. Then back to work, but only for two days! 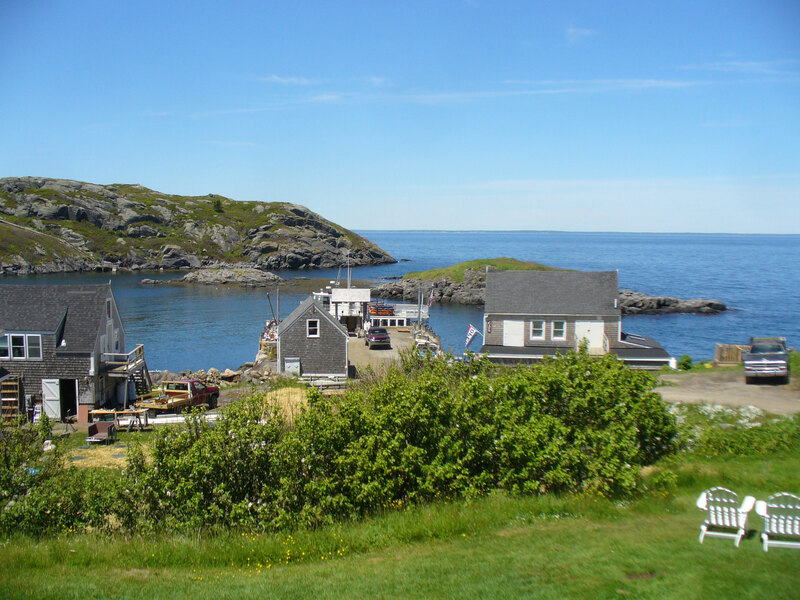 Off to Monhegan for a couple of days this week, I can’t wait! I hope the weather keeps on being really good, it is much nicer there in the sun than the rain. I know this from having been there in the rain lots of times and the sun only a few. Hello! 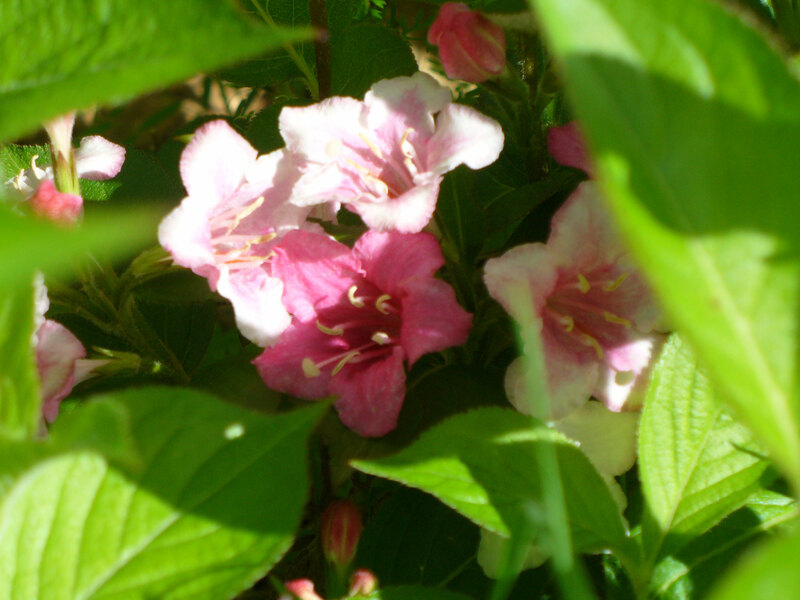 I hope that everyone is having as gorgeous a day as we are – it’s one of those “nothing so rare as a day in June” days – light breeze, bright sunshine, not a cloud in the sky – no humidity to speak of – just perfect! Wish we could have more of these days! So you know – I did get off the couch today. 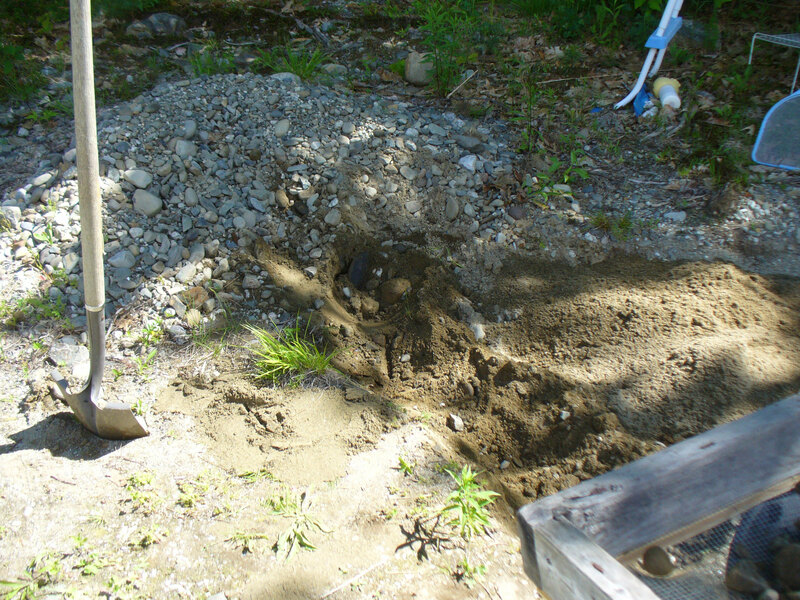 In fact, I have already gotten some noticeable work done outside! Sister-in-law L came over for a late breakfast this morning, and brought my early birthday cake, so we had a yummy breakfast followed by mocha cupcakes. Mmmmmm. I worked out in the pool area today, and ya know, after a full three seasons of this endless toil, I came up with something that seems to make it go faster. Two vehicles. One is the old wheelbarrow with the completely flat tire. So flat that when I tried to blow it up, WATER came squirting out from many places. I guess we need a new tire. 🙂 The other is my old yellow wagon that we got when we cleared the land almost ten years ago. It isn’t perfect either, the handle is too short, meaning that it is awkward to tow, but it has 4 good tires and it has a dumping mechanism. So. Now I have a method that is not quite so slow and awkward. 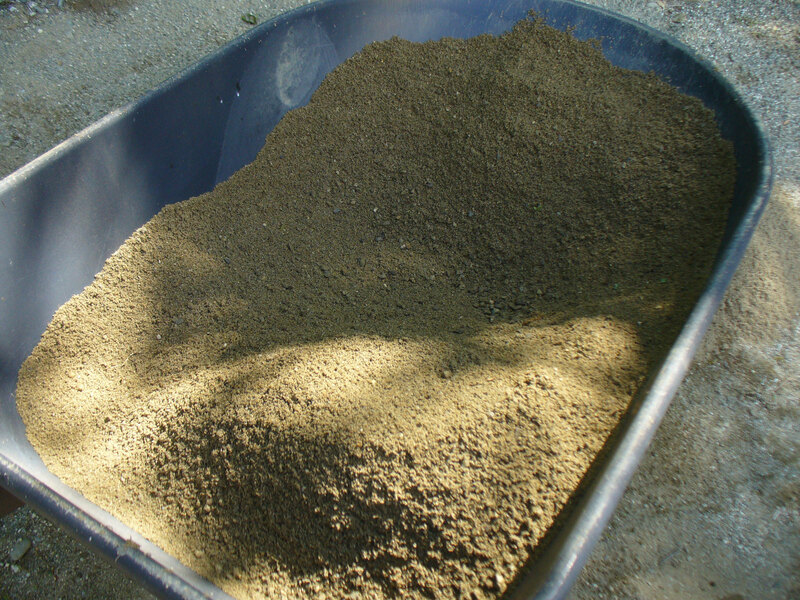 The wheelbarrow is parked in the pool area with the sieve on top. The little yellow wagon is parked next to it. 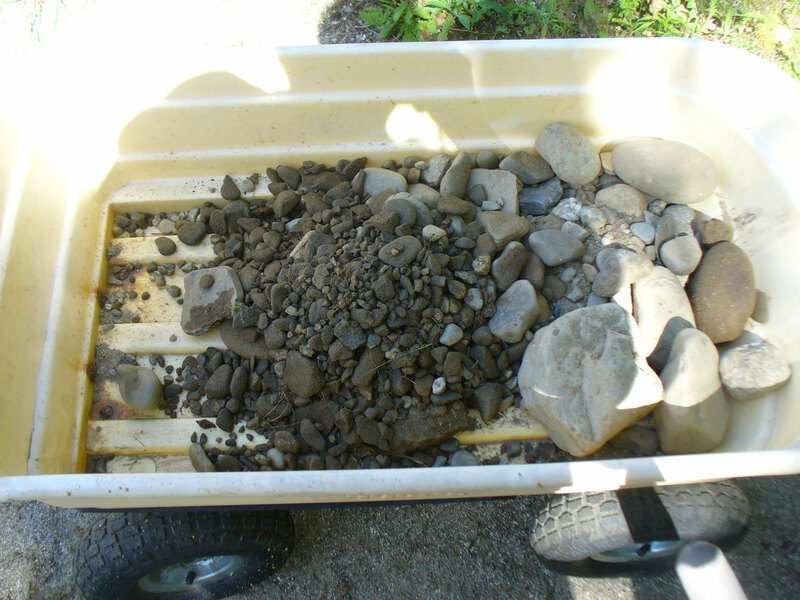 I sieve the rocks out of the sand, the sand falls in and around the wheel barrow, and I shovel the remaining rocks into the wagon. 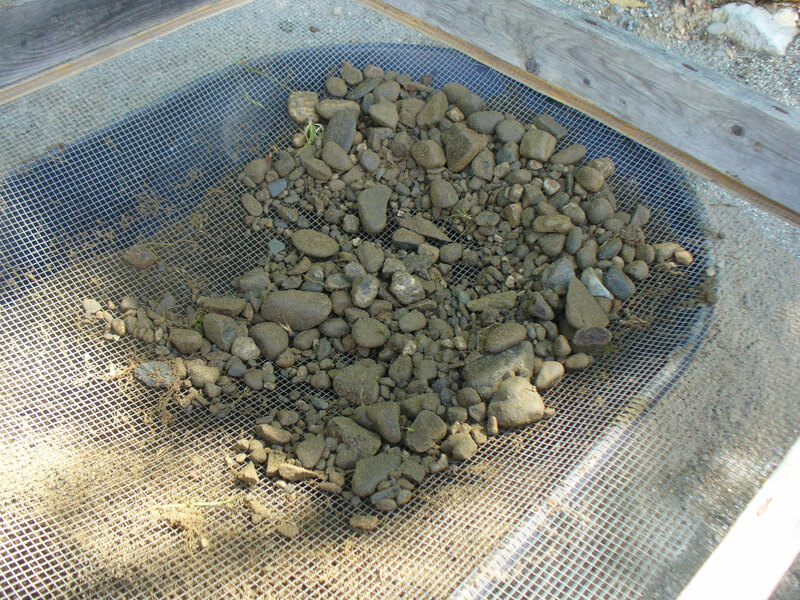 When one or the other is full, I dump the little rocks from the sieve into the wagon, dump the sand in the pool area, haul the rocks over to the path I am making, dump them in the hole, dig out a new section, take that sand back to the pool area, and repeat (having figured out it is better not to make a pile that will later have to be moved to the path, just make the path now, stupid.) 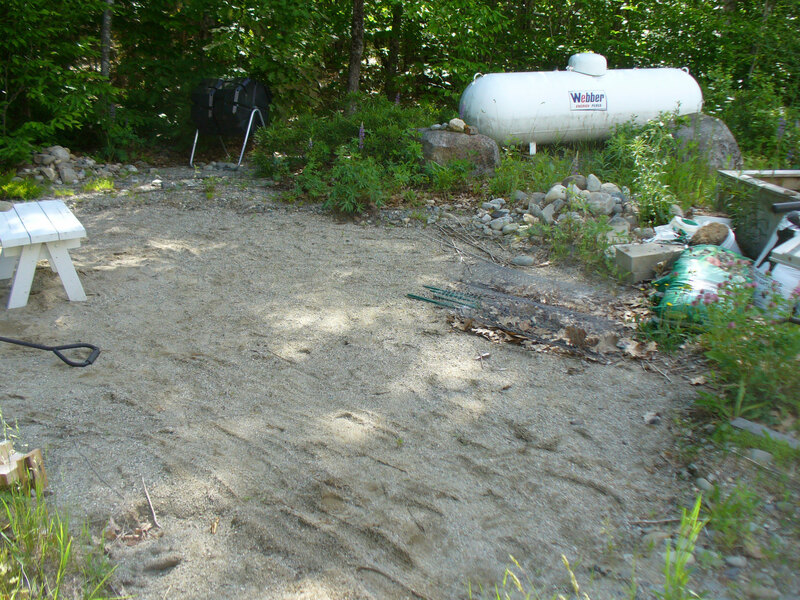 It is still slow and hot, and yes, it would be easier to buy a load of sand, but I am not giving up yet. 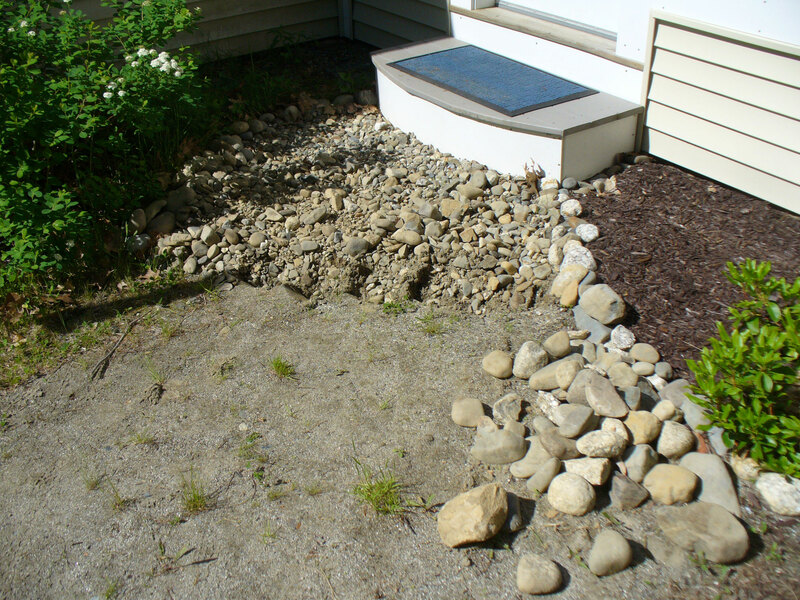 🙂 I try not to think about the fact that where the path is there are no rocks, because the pool was there the first year, and where the pool is going is where I put the rocks back then. Like I said, better not to make a pile to move later. I need the camera because I had to take photos of what I am working on today, which is the Indian Feather shawl – only twelve more rows of lace to go – and then the body of it begins. See the tiny beads? I really should use larger ones next time. If you remember, Pine Star Studio was on my list, Linda has a wide array of nice colors, fun sock yarns, and other interesting things, as well as some of my favorite lace weight yarns. Here is where the budget interfered with my avaricious soul. I wanted some of everything. She has amazing cakes of yarn that are broad bands of different colors, I think they would make amazing shawls. 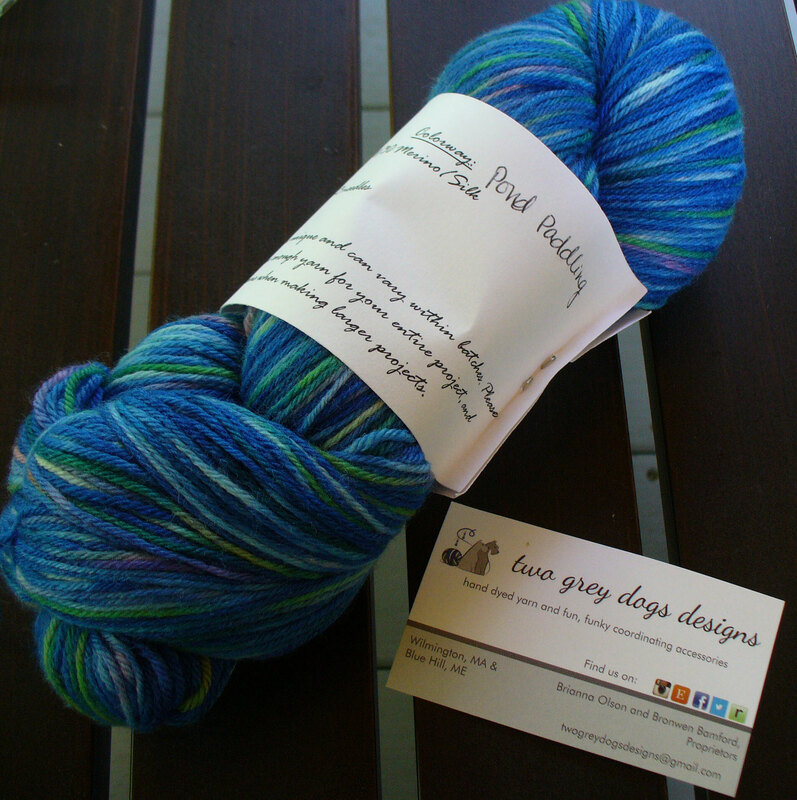 She has amazing sock yarn, and she has lefty shawl kits – oh oh oh. But I stuck to my plan, and got this lace weight yarn – I have a plan for it with the silk garden Noro I won many moons ago from Claire over at Molly and Claire. I think if I hold it double, it will be close to the same weight. We will see. 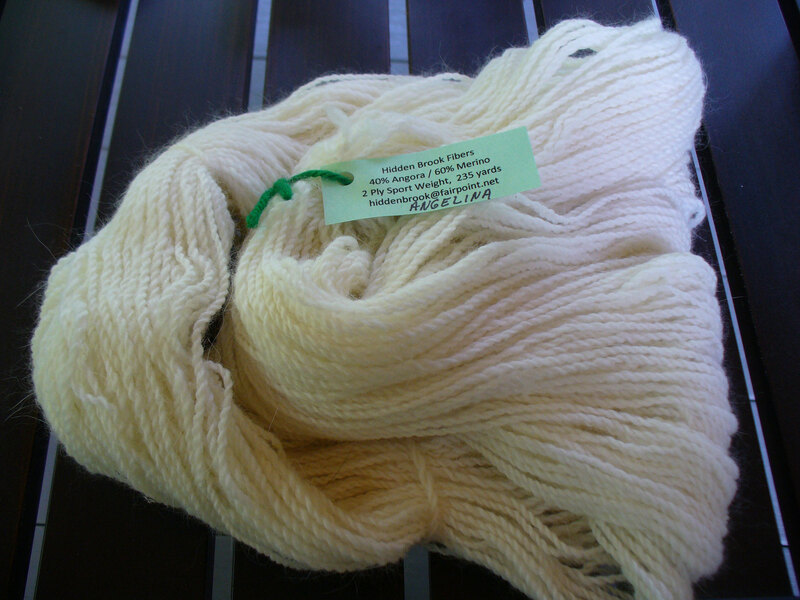 RIGHT NEXT TO HER was Hidden Brooks Fiber – the very nice lady named Carol makes the softest, most affordable angora blend yarns ever. There were several to tempt me, but not the blue I was looking for! So, I got a white one, and will dye it the right color. Again, an unlimited budget would have allowed me to clean her out of her white and gray and bring them home to dye myself. She is working on her website, and I can’t wait to see it up and running so I can order lots and lots of yarn from her. You know, when I win the lottery. A few booths down was my seriously most exiting find of the day. A woman I worked with many years ago as she started her business, and whom I had lost track of. 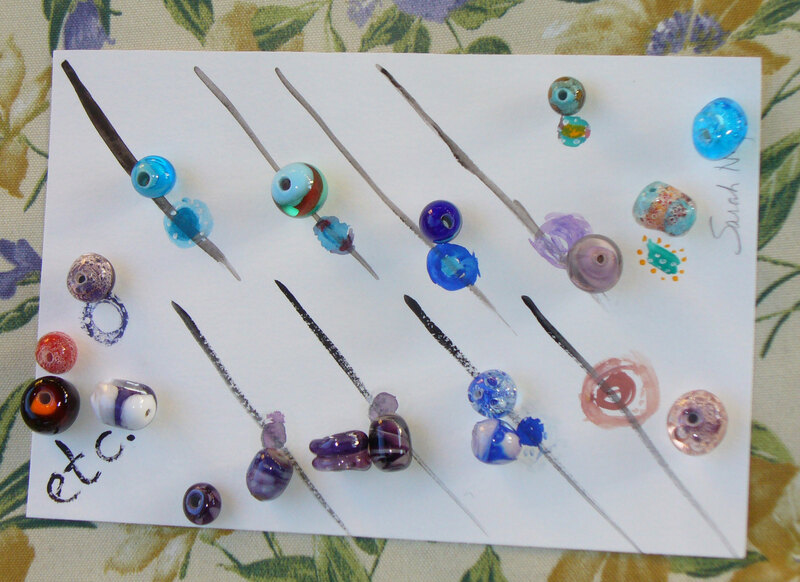 Not for lack of trying, though, I love Judith’s glass buttons, and wanted more. Mostly so I could stop hoarding the few I have left! Anyway, I had tried to find her on the internet, etc. with no luck. So when I spotted a big booth with her name above it, I was thrilled. She was mostly selling her beautiful hooked wall hangings, but in the corner were her wonderful buttons, just as I remembered them. Hers are different from any I have seen (mind you, I don’t get out much!) and are perfect for the hats I can’t stop making. I limited myself to 3, but grabbed a card, so I won’t lose her again. Keep your eyes out for her – Judith Hotchkiss. Her buttons would make a plain stockinette cardigan sing. Next up was a stroll toward lunch, and it brought me past a booth that just screamed with bright colors. I needed my sunglasses! I went in on a whim and found this yarn which I think will be socks for my littlest niece E who loves bright colors. It wasn’t until I got it home that I realized it has none of her favorite color, purple, but I think she won’t notice. 🙂 With a name like Mad Color, how can you go wrong? I saw so many other vendors that were selling things I would have loved to have – and there was a bead lady there who I have seen on Ravelry – she was selling beads in larger batches than I usually want, but I keep thinking about one particular set she had, so will likely be in touch to see how I can get them someday. I also saw lots of old friends from the days when we ran our Incubator Without Walls program for small businesses – they all look so well established and professional now, it is fun to see them and think about where they were 5, 10, or 15 years ago. They have worked hard, and it shows. I wish I could have bought something from everyone. I was going to hang about for the Ravelry hook-up at 2, but by the time I had lunch, I was beat and ready to go. Plus, at lunch I did my one extraverted thing, and channeled my dear old friend Kate (who made friends with everyone in a 30 foot radius always) and sat with strangers at lunch, and even spoke to them! It wasn’t as bad as it could have been. 🙂 I chose strangers who were sitting at a table in the shade. I ain’t no dummy. So if you are watching, Kate, you can be proud that you taught me it is OK to talk to strangers. In small batches. In the shade. After all of that shopping, and lunch, and the obligatory homemade ice cream on the way out (Stone Fox Creamery, Chocolate Salted Caramel, oh my) I left the Fiber Frolic with 17 dollars still in my pocket. That’s enough for another skein of Pine Star lace weight… or a couple more buttons… what was I thinking? Time to go back outside and get some work done. I am off to the Fiber Frolic in a couple of hours – so just thought I would document what I think I am getting – then we can check in later to see how I did! I aim to find the Hidden Brooks Fiber lady, and get some of her luscious angora/wool blend – I have someone interested in my Chevron hat, but in a smaller size. Her website was our of commission the other day, so I need to see her in person. And see all her fiber. So sad. Then I want to connect with the Purple Fleece, and talk about spinning lessons. And maybe buy some of her bright colored yarn. 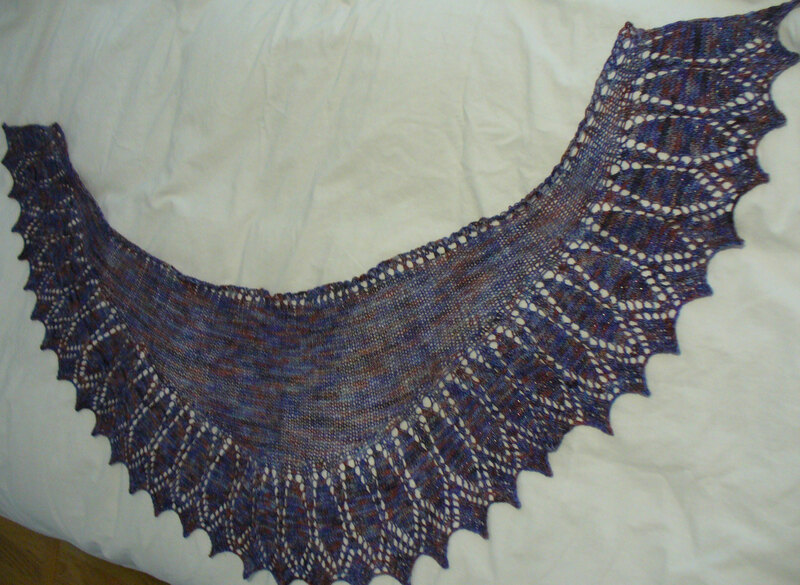 My old favorite PineStar is on the vendor list, so I will stop by and PROBABLY get some yarn for another lace shawl, because really, you can’t have enough of them, right? I’ll be on the lookout for some sock yarn, and new vendors and other exciting stuff, but I will be trying hard to stick to my budget. Our plans for today have changed a bit – A has to work halfway across the state, and originally, we thought the timing would work that she could drop me at the fair, go work, then pick me up several hours later. But between the time she would have to drop me off and the fair would actually open is a couple of hours, and I just figured it made no sense to sit and hang out there for that long – even though I could knit, it is a bit longer than I want to be standing by the side of the road. So, I will do a few things this morning, including going to the Post Office to see if any of the clothes I recently ordered have arrived – and if they have, I might come home and change, lol. I’ll head out around 9:30 or so, and stay at the fair for a couple of hours – if I have the energy, I will hang about until 2 when there is a Ravelry hook up. Never been to one of those, but I will give it a shot. Very silly, but it is a big deal to this introvert! Tomorrow, I have no plans, I should do a bit of cleaning, of course. 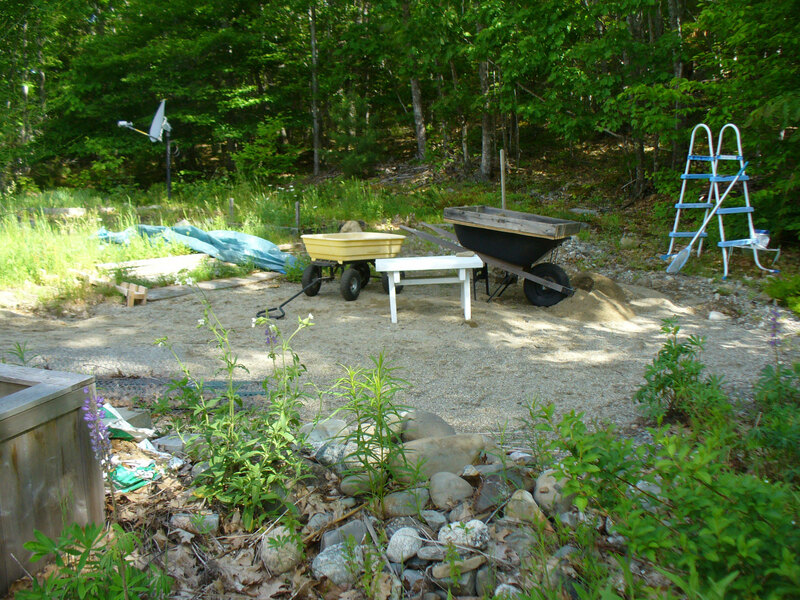 And yard work, since I will do none today. It will be tough to get off the couch with all that new fiber, though. First up – yarn and knitting. 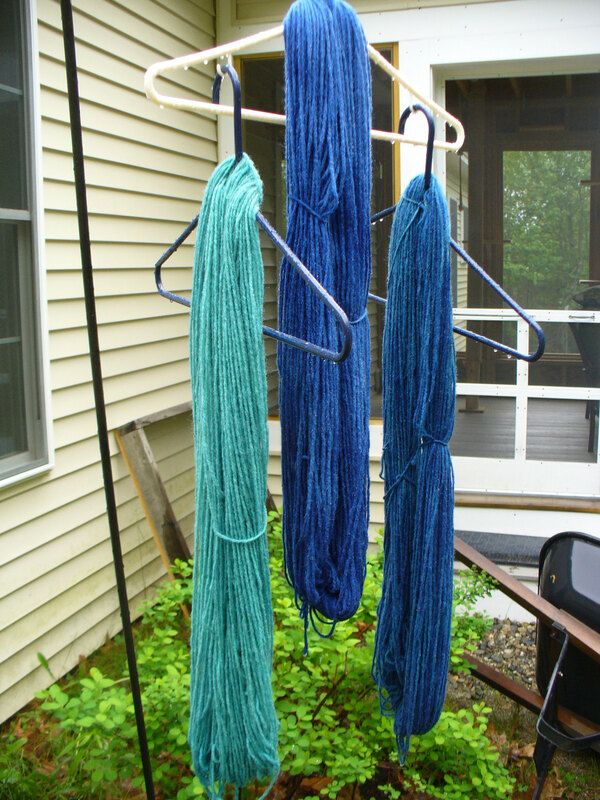 Here is the newly dyed yarn hanging in the rain – not drying. And here it is all dry, with the first batch I did. I think these colors will work well for the lefty shawl. 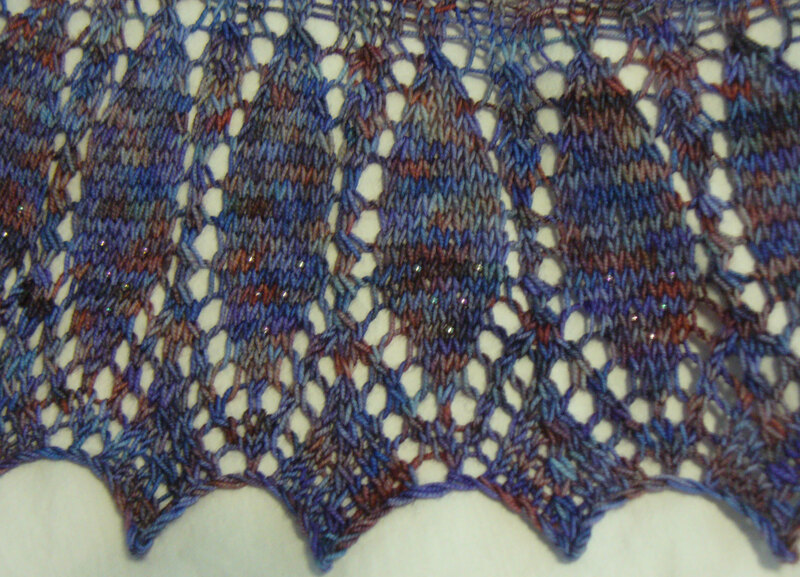 Next up is the lace leaf shawl adaptation – I did not block it hard, so it has more texture than my purple one. 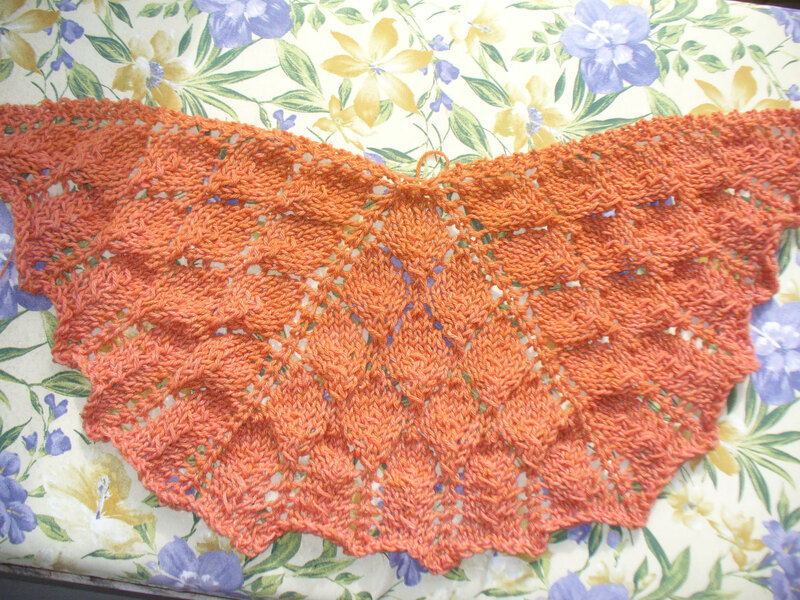 And as you can see, I added one stitch when I cast on, and created a third section of leaves, for a different shaped shawl. This is the yarn I dyed using beets, and it just is too orange for me. But I like what the pattern did with the extra section. Here’s the beginning of the Indian Feathers – I will likely wish I had used size 6 beads instead of size 8, but these are the ones I had that looked nice with the yarn, so it is what it is. Now, onto the glass beads. Remember last month I took that class? 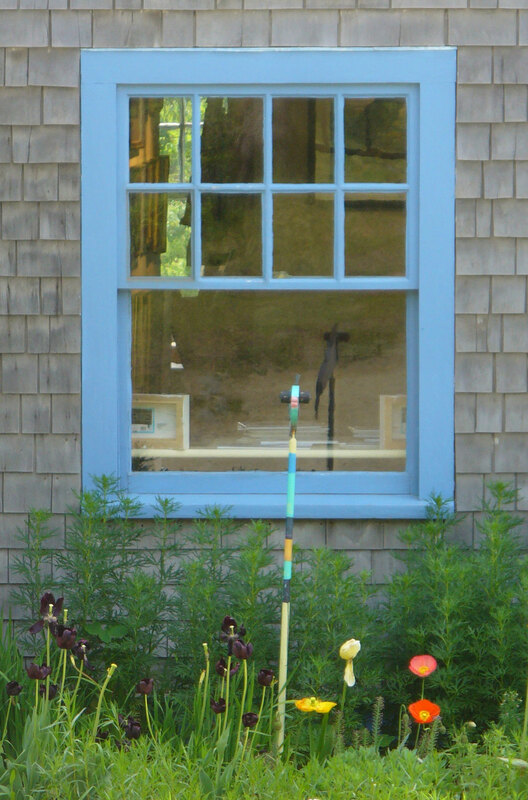 One aspect of the Haystack day is a studio “tour” where everyone can look at what was made during the day. 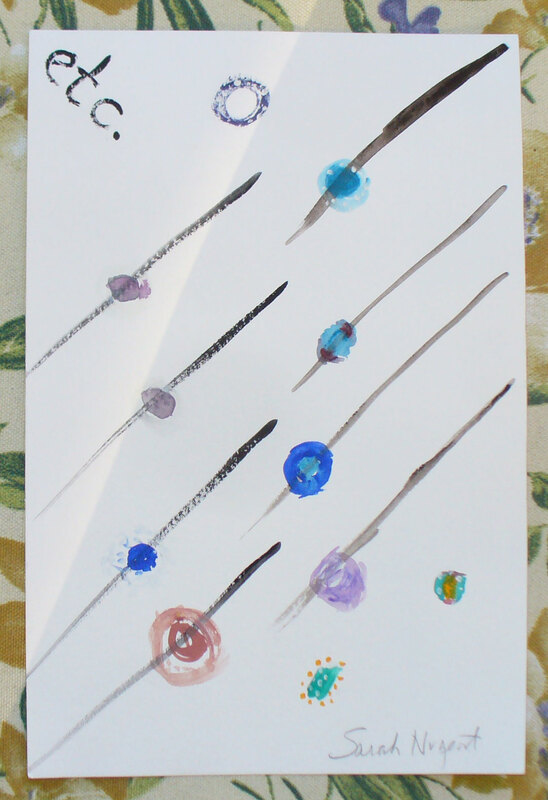 But our beads were still in the kiln, so she had us paint pictures of what we were making. I am not artist, for sure, and of course, I had no idea if what I thought I was putting into the kiln is what would come out! So here is the card I painted that day. 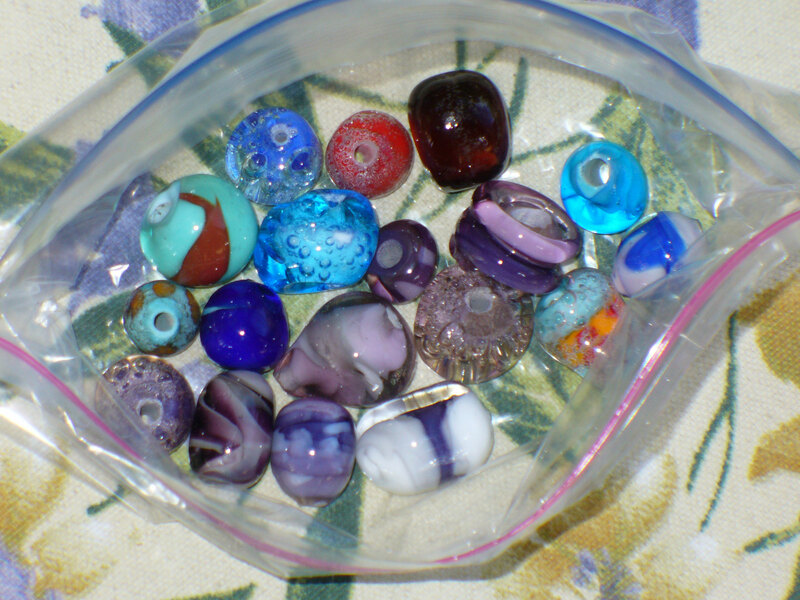 And here are the beads, which I was finally able to pick up this week. Definitely lumps, but some of them are pretty, if you don’t worry about what they were supposed to look like. I love the bubbly ones (that was on purpose!) 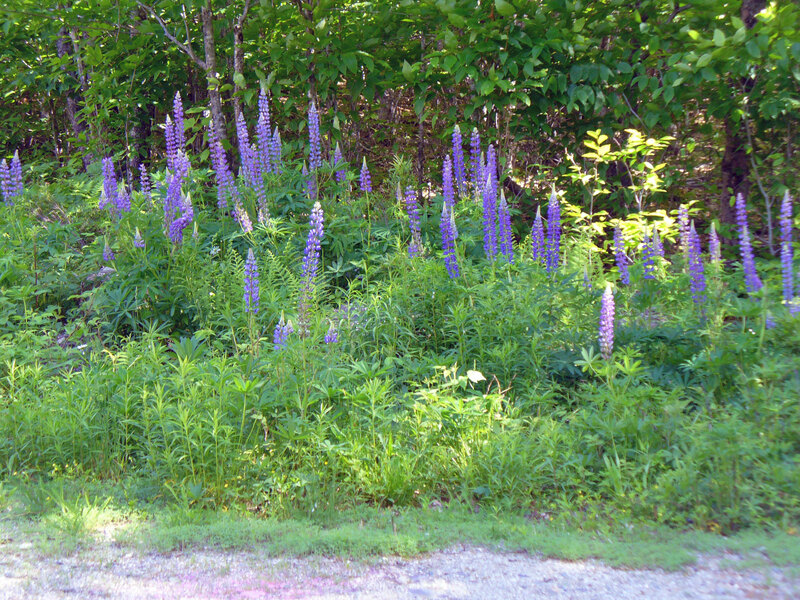 and some of the purple ones – I was trying to get the colors of a mussel shell. Failed that, but they are still pretty. 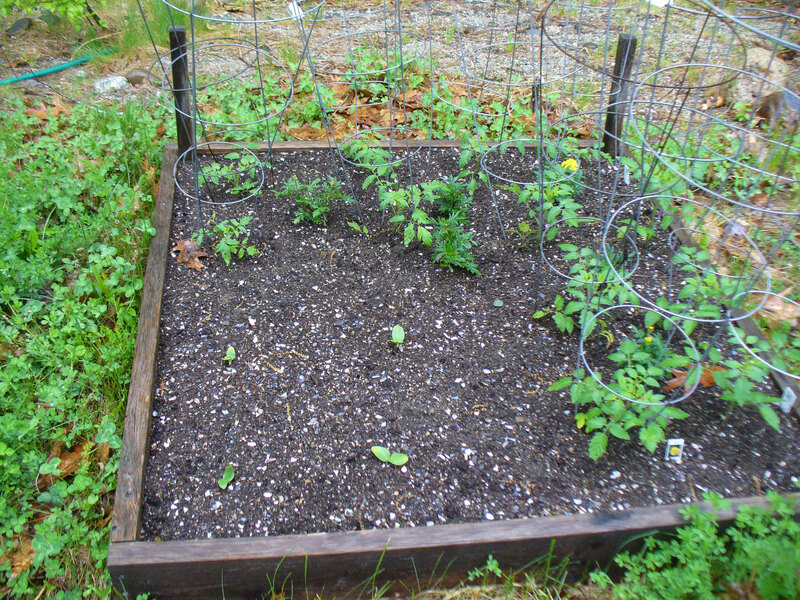 Then there is the garden this week – veggie plants are sprouting like mad, loving the rain. 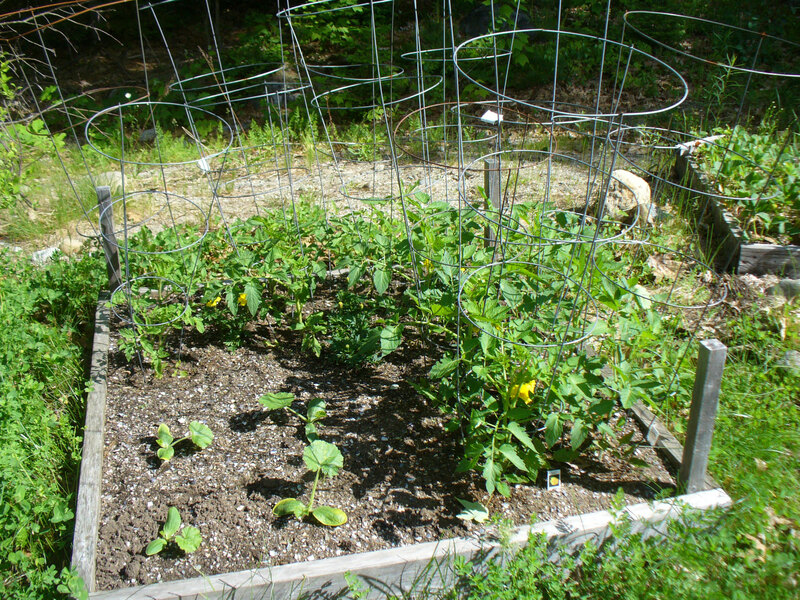 Tomatoes are in a holding pattern though, waiting for warmer weather. Which will come eventually, right? 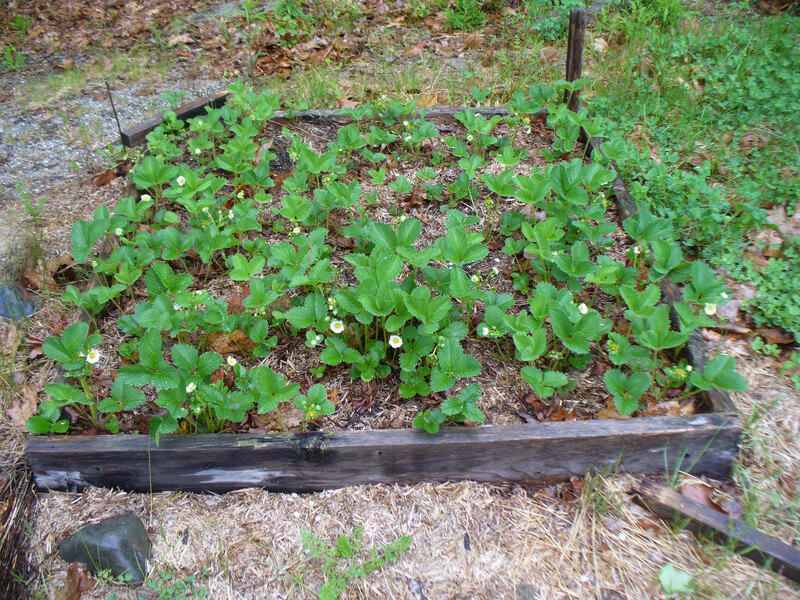 The strawberries look better than ever, and I ignored them this year. All I do is pull out the occasional weed. 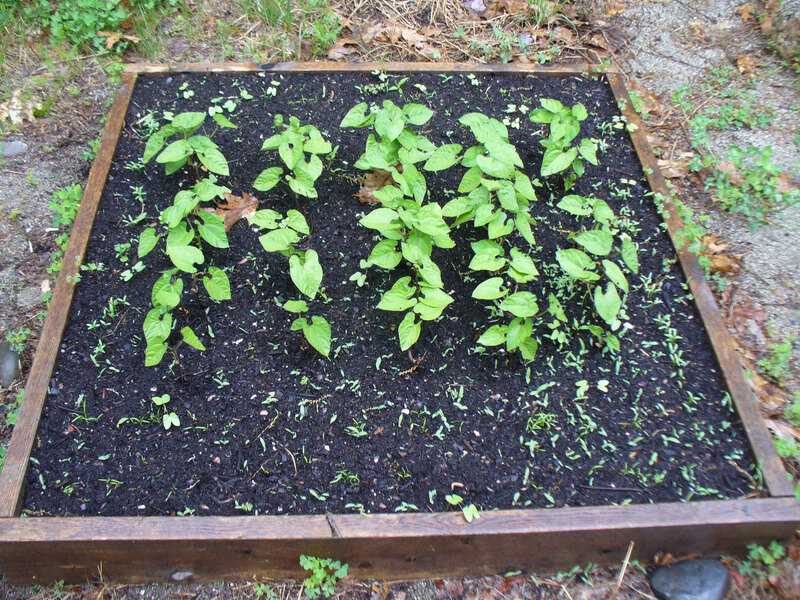 No compost, no mulch, no bird netting. I am disowning them, if they produce, great, if not, out they come. They take up too much space for the yield. The tomatoes are holding on, but the squash popped right up! 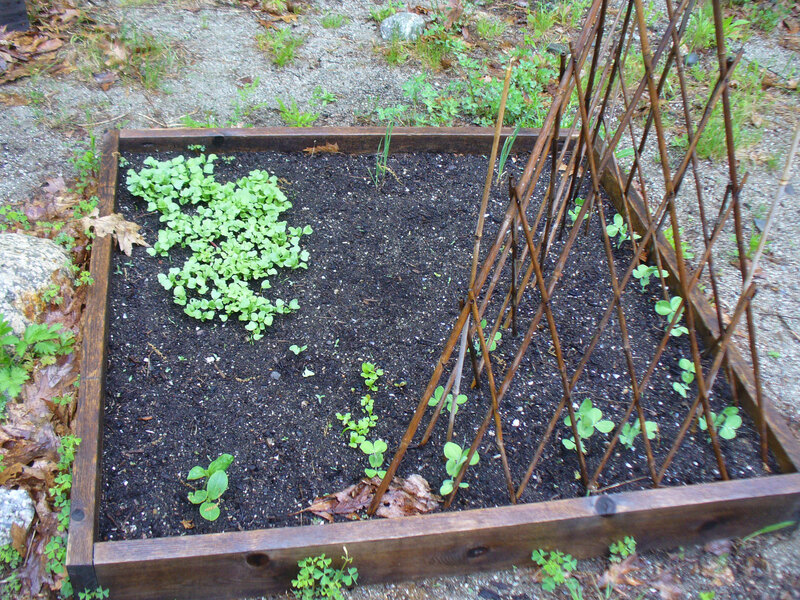 Here we have radishes, garlic, lettuce, mesclun mix and peas all doing great. 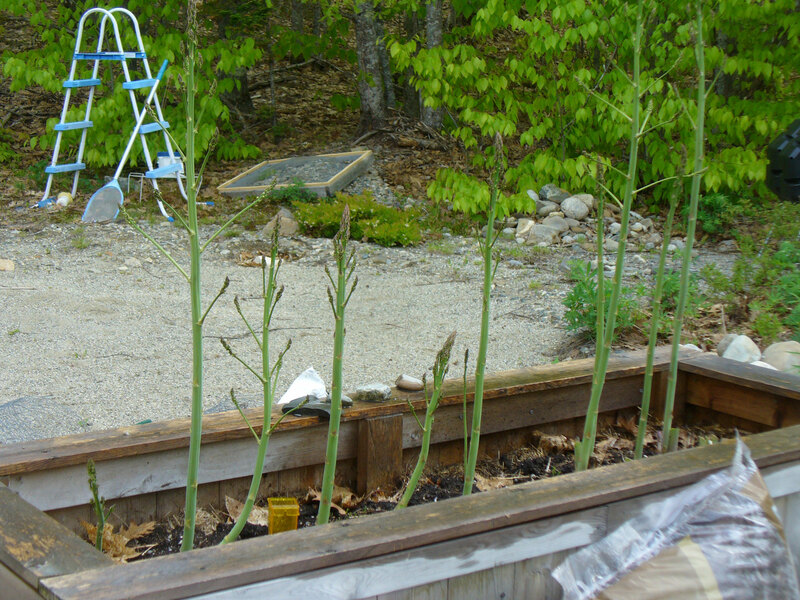 Carrots are in there, too, they will sprout soon among the radishes. Oh, and there is a small pumpkin patch in the corner. This patch is sister-in-law L’s. 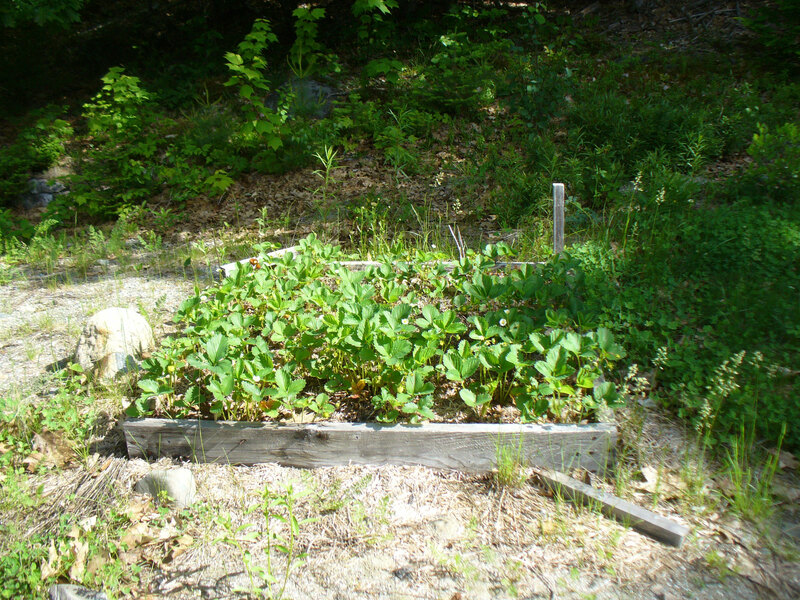 Not sure what all she has planted besides beans, but I do know that she is also getting grass and morning glories (which she did NOT plant.) 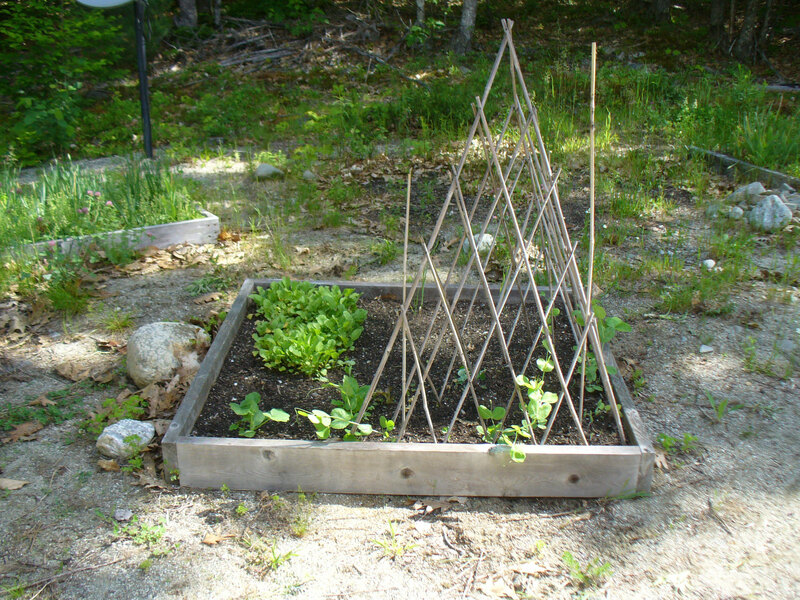 and the beans look great! 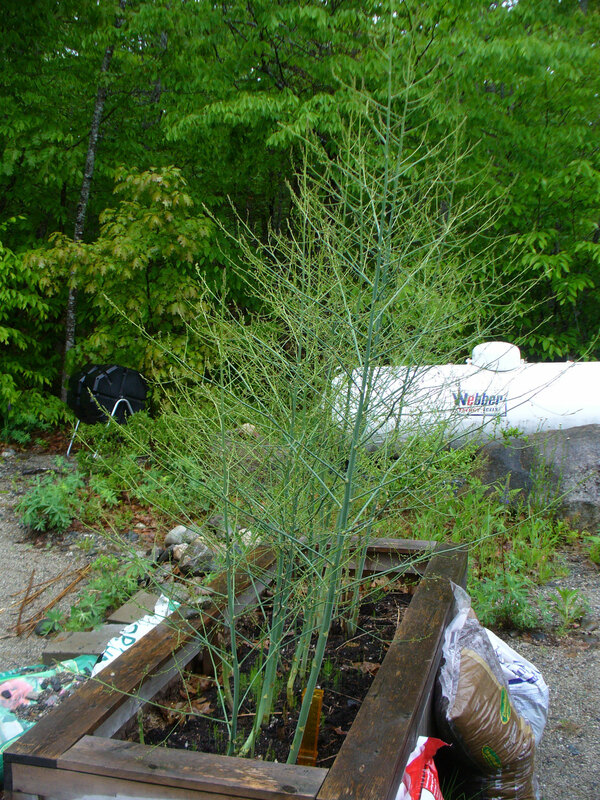 This is the asparagus – we ate a lot of it this spring, but I am letting the rest go to grow and fill this planter bed. 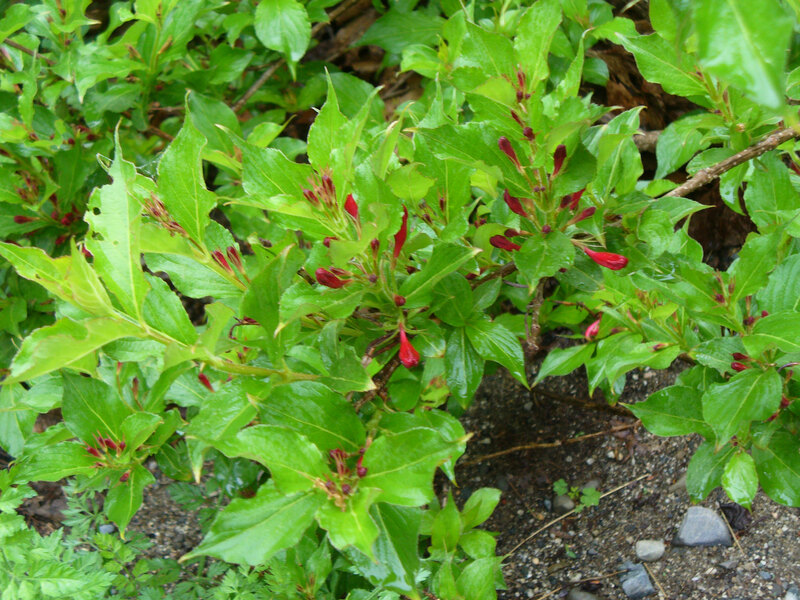 and wygelia both getting ready to pop with color. Here’s a gratuitous sugar bomb picture. 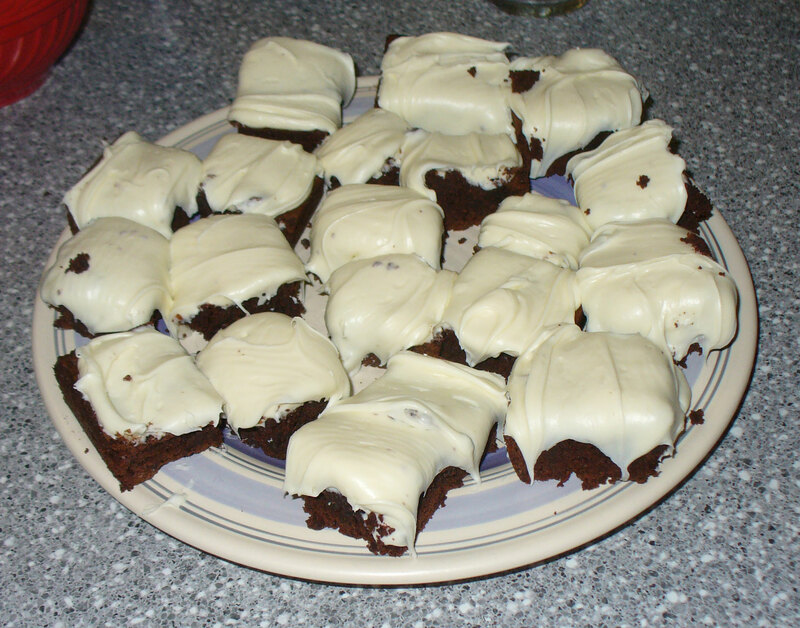 Last weekend A was craving sweets, so I baked brownies. then she asked if we could frost them. We could, we did, they were delicious but an incredible pile of sugar, couldn’t eat too many of them in a sitting! Author salpal1Posted on June 6, 2015 June 6, 2015 Categories how I plan to spend my day, how it came out, what I am making, what I am thinking about makingTags alpaca yarn, beads, crafts, Fiber Frolic, garden, handmade, knit, photos, to-do list19 Comments on Saturday at last!